I can still remember the first time I saw R-Type appear in the Quay Amusements in Poole in 1987. It caused a real stir and I know I wasn't alone in being blown away by its superbly polished production. 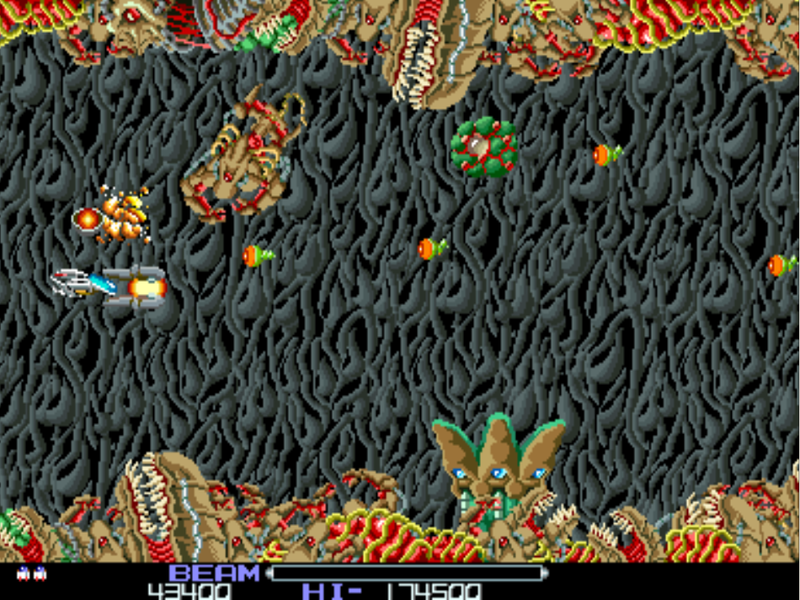 Its combination of brilliantly drawn and animated enemies, gorgeous moving backdrops and unique bosses, really did thrill us arcade game players. It was released just one year after my other favourite shoot 'em up, 'Slap Fight' (a game I like to compare it against quite a bit). I think that R-Type redefined the genre by upping the ante in terms of design. 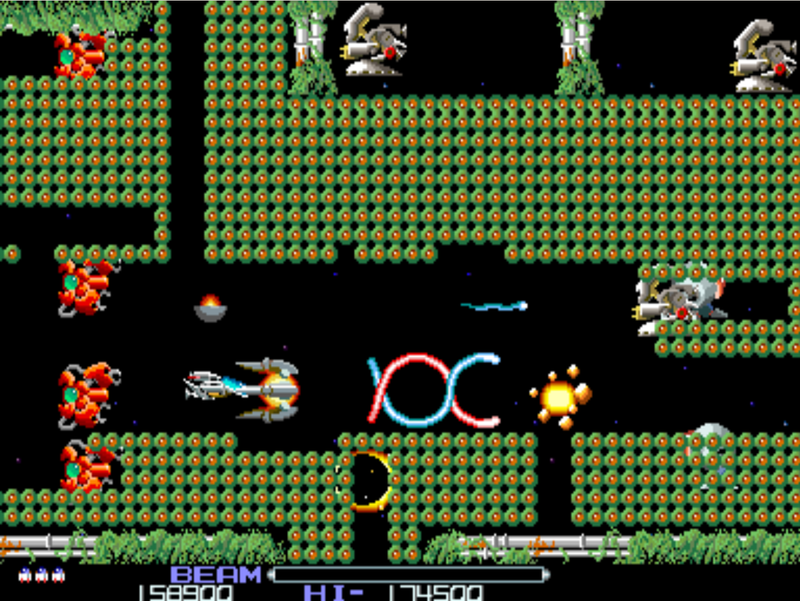 - Levels, weapons, bosses and music were all beautifully crafted and were a real league apart from your average shoot 'em up that existed at this time. 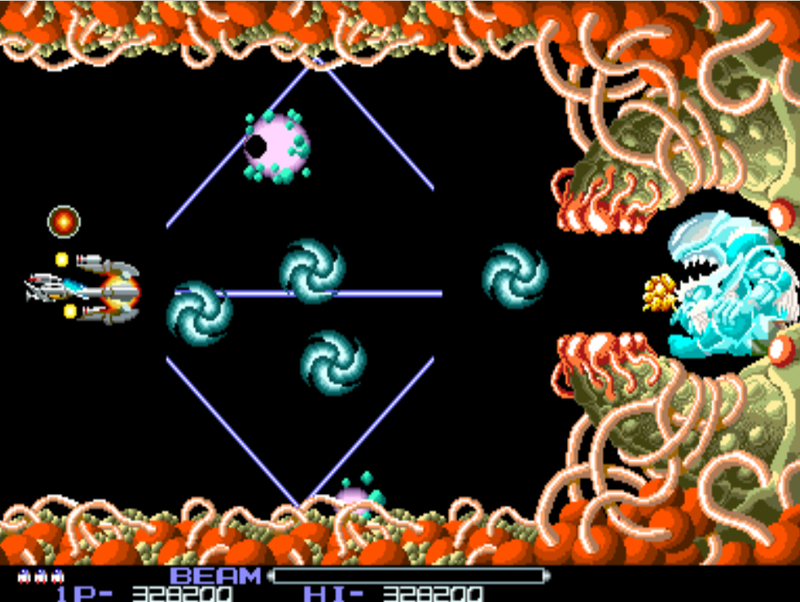 R-Type is quite a big game and unlike Slap Fight, it consists of eight discrete levels (although the game continues and loops around again past level 8). 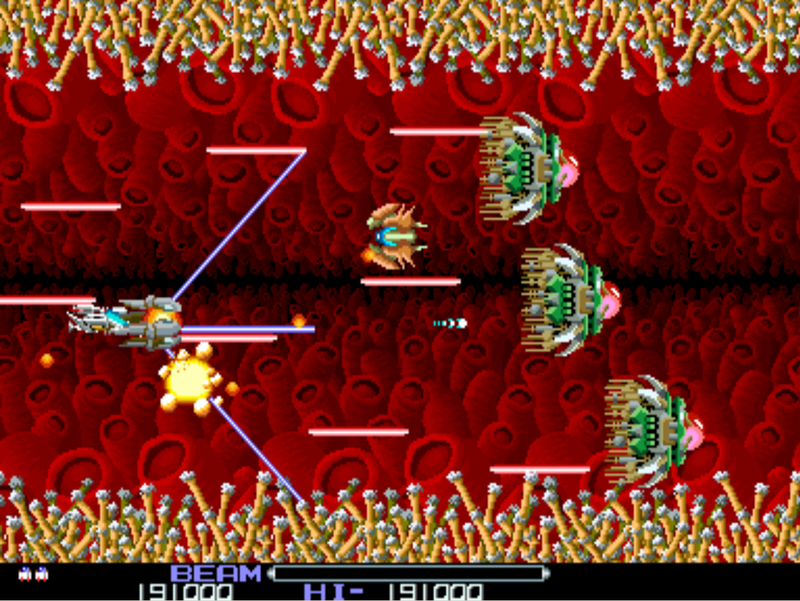 During these eight levels (which are always horizontally orientated and scroll from left to right), the player moves through a series of gorgeously created worlds, fighting off the enemies within the evil 'Bydo' empire. 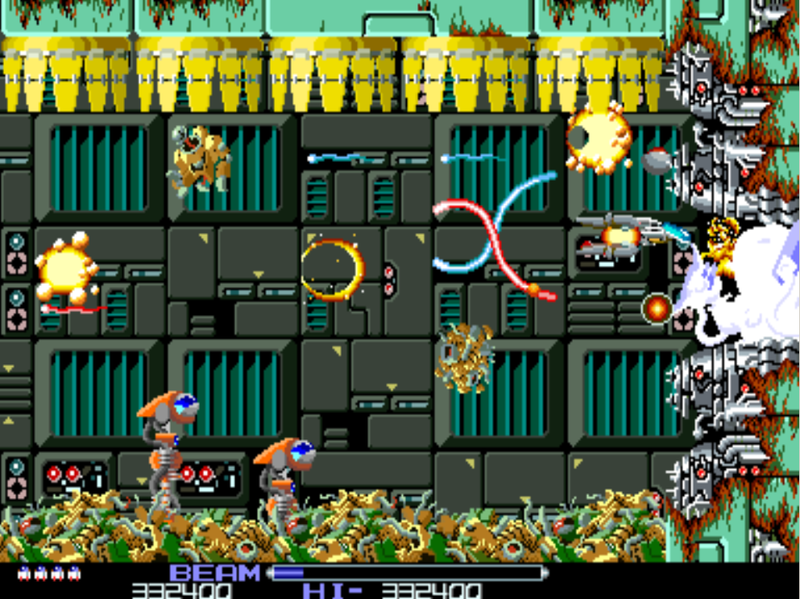 Each level normally consists of a different backdrop, a differently designed top and bottom section of the screen and of course a variety of onscreen elements and enemies. In complete contrast to Slap Fight, with this game it is possible to crash into any onscreen enemy and die. It is also possible to crash into the scenery. These two differences alone, make for completely different gameplay and greatly increase the difficulty for the player. 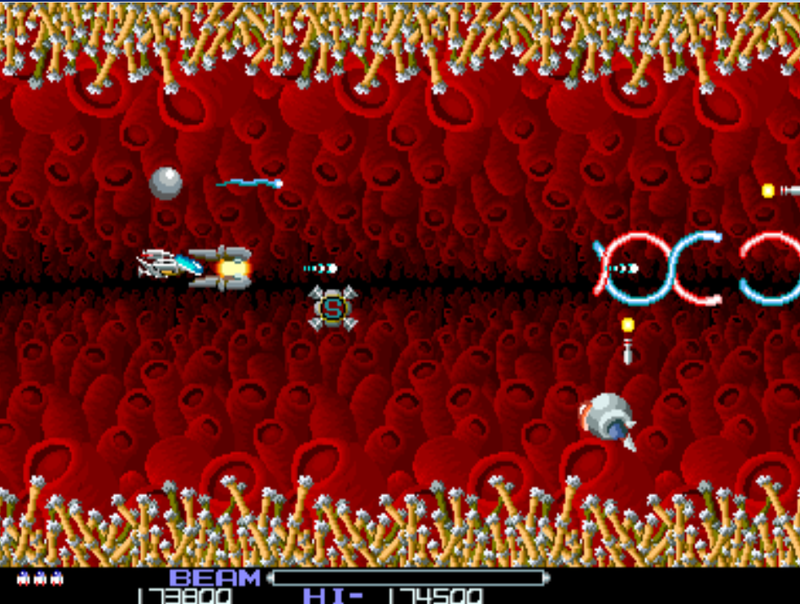 Fortunately, to help you progress through the levels, Irem came up with a brilliantly innovative weapons system. I will look at those in more detail below. 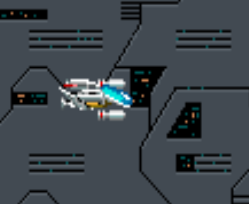 Your ship in R-Type is a relatively small but rather snazzy looking craft, referred to as the 'R-9'. Presumably, this is where the 'R-Type' game title stems from; as in the 'R-type' craft. It's a pretty cool little ship, with a glassy blue front end. When you move the ship around, it rolls up and down to a small degree, meaning it's orientation to the player changes slightly. So you can 'see' above or more 'underneath' the ship during certain movements. Your ship is initially only armed with the 'Shot' weapon. But as we will see, it is potentially quite powerful, due to the upgrades that can be attached to it. The most crucial of these, is called the 'Force'. 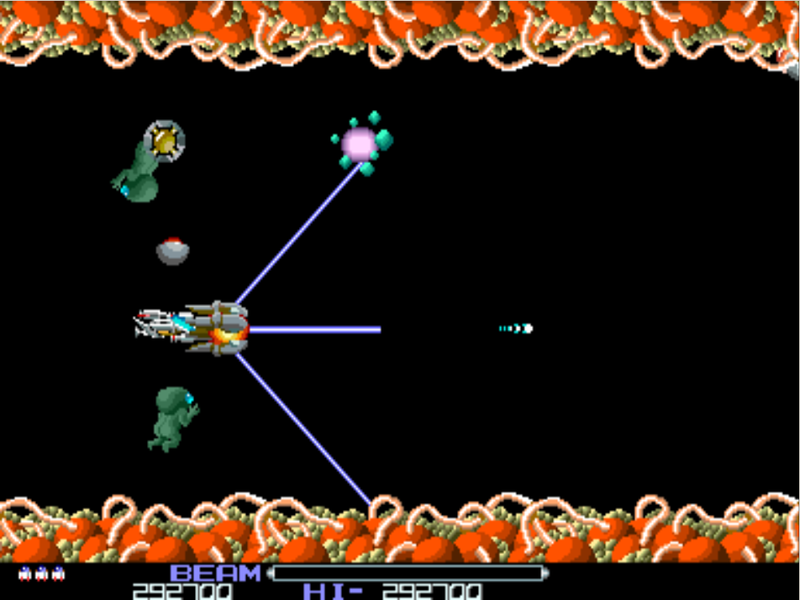 The Force pod is one of the great design elements of R-Type. 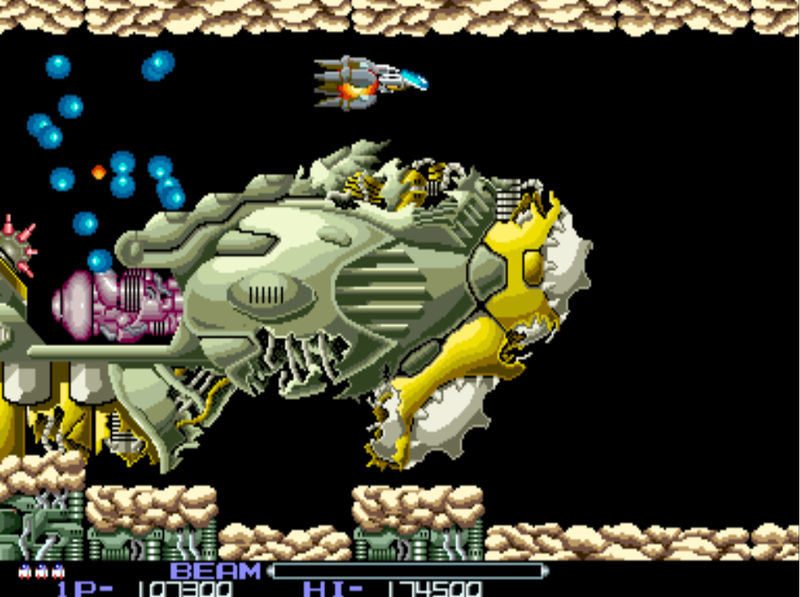 More than that, it is one of the greatest design elements of any shoot 'em up. 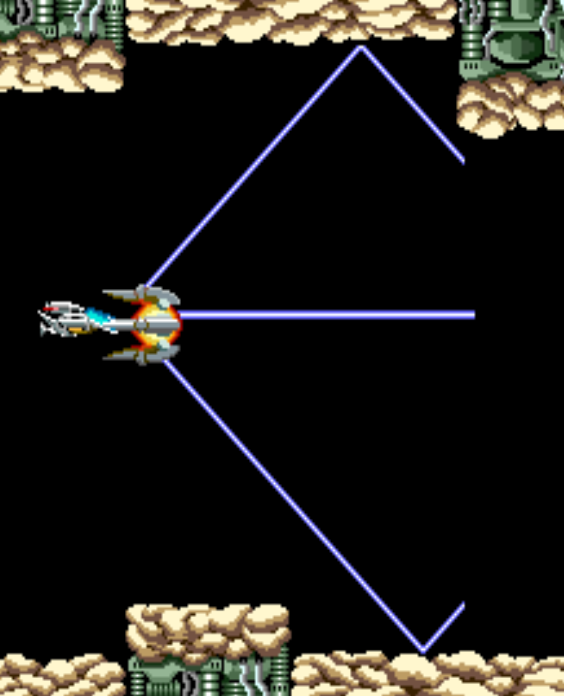 Just as Taito created an innovative weapon system in Slap Fight through the use of 'wings'; here, Irem came up with a brilliant piece of game design which is arguably even better - not least because of the way it provides additional variety during game-play. The 'Force' (which incidentally is Irem's name and is referred to as such in their documentation and flyers) is an indestructible pod that can be attached to either the front or the rear of your ship. And 'indestructible' means exactly that. It is not possible to destroy a Force. Aside from being able to attach a Force to the front or rear of your ship, it can also be detached from the ship, whereupon it will float freely on the screen, contributing fire-power (albeit with just the 'shot' weapon). The Force can absorb any 'normal' enemy bullet and will also destroy on touch, any 'normal' enemy. This is incredibly useful! However, some enemy fire will pass right through the Force - and as a player, you need to be wary of these. Likewise, enemies who have larger numbers of hit-points will not be destroyed immediately when the Force touches them, rather they will take damage and therefore more time to kill. In its detached state, the Force will fire the 'Shot' weapon in time with your own ship. The power of this Shot weapon is dependent upon the level of the Force. The Force has three levels of power. The Force only fires the Shot weapon in the ways shown here, when it is detached from your ship. When it is attached to your R9 ship, at levels 2 and 3, it will fire a Special Weapon. We will look at these shortly. The 'Force' will arrive on the screen the first time you pick up a Special Weapon icon. It will arrive detached from your ship and it will fly itself remotely on the screen, using the position of your ship as its marker. If your ship is positioned in the left half of the screen, the Force will fly ahead of you, keeping itself in the final third of the screen. If you move your ship past the centre point of the screen, the Force will automatically retreat back to the rear third of the screen, keeping itself behind you. At all times whilst detached, the Force will try and keep itself orientated to your vertical position. As you move your ship up and down, there is a small amount of lag as the Force 'catches up' with your vertical position. As it happens, this lag is actually quite useful; since it means the Force is laying down fire on a different part of the screen to your ship. I've no doubt it was a deliberate design decision (rather than being due to some technical limitation). Whilst detached, the Force will remain so indefinitely until the player either presses the 'send/recall' button or moves within a close proximity to it. If the send/recall button is pressed, the Force will manoeuver towards you and attempt to dock with your ship. During this period, you can move your ship and fire your weapon as per normal, but the Force will continually attempt to dock with you until it succeeds. This effect cannot be cancelled. Alternatively, you can simply move your R9 ship within a close proximity to the Force and it will find your ship quite irresistable and move towards you, trying to attach. If you use this method, you are able to 'cancel' it by just moving your ship away from the Force again. The Force will then return to it's default detached position. A level 1 Force attached to the rear - the weakest combination! The Force can be attached to either the front or rear of your R9. This provides a good deal of flexibility and adds yet another layer of variety to game-play and tactics. If you press the 'send/recall' button when the Force is already attached to your ship, it will immediately detach, sending it across the screen until it hits the far edge. Once it hits the edge, it will slowly retreat back to its default position, which is roughly a third of the way in from the right side of the screen. Of course, if you do this when it is attached to the rear of your ship, it will fly out until it hits the far left side of the screen and then move back to a position roughly one third of the way in from the left hand side of the screen. The majority of time that you have a Force, you will have it attached to your ship. It affords you the greatest protection in this way and of course, (if the Force is level 2 or 3) - it then fires one of the three special weapons. As previously mentioned, the Force is completely indestructible and will remain with you until you lose a life. It's also worth noting that as far as I can tell, the damage output of a Force when touching an enemy is identical for all levels of Force. So for an enemy that has a high number of hit-points, contacting that enemy with your Force, will always take the same length of time to destroy, whether the Force is level 1 or level 3. 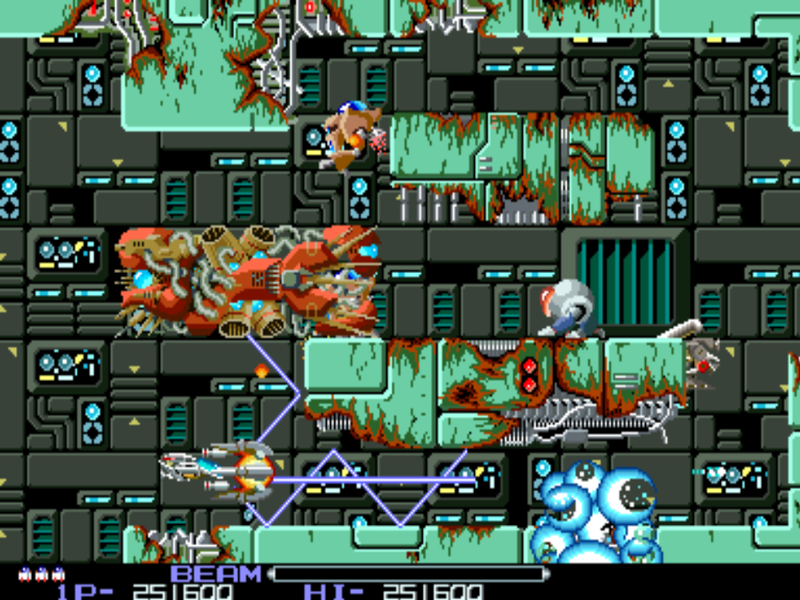 There are four main weapons in R-Type. The first is 'Shot', which is your default weapon and this cannot be upgraded. The other three are 'Special Weapons' whose effectiveness is influenced by the power of your FORCE pod. 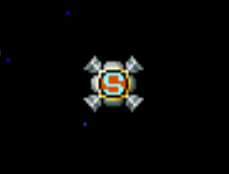 We will look at each of these in more detail, but to pick up a FORCE (and in so doing, move towards gaining a Special Weapon), you must pick up one of the Special Weapon icons shown below. This will happen if you pick up one of these icons for the first time. Note that you will not be given a special weapon and you will still fire 'Shot'! You will gain the Special Weapon indicated by the icon above if you collect one whilst already having a level 1 Force. Yes! No matter what happens, you will always be awarded the princely sum of 400 points for picking up one of these! 'Shot' is your basic and default weapon. It is retained at all times and will always fire from the nose of your ship, regardless of whether there is a Force attached and regardless of the level of that Force. This means that if you have a level 2 or 3 Force attached to your ship (and are therefore using a 'special weapon'), the Shot weapon will still emanate from your ship, in addition to the special weapon. If you die, your new ship will always appear equipped with just this weapon. 'Shot' can be fired as fast as you can hit the fire button. As shown previously, there is no 'Shot' weapon icon. So this means that you cannot upgrade the power of this weapon, like you can with the other weapons. 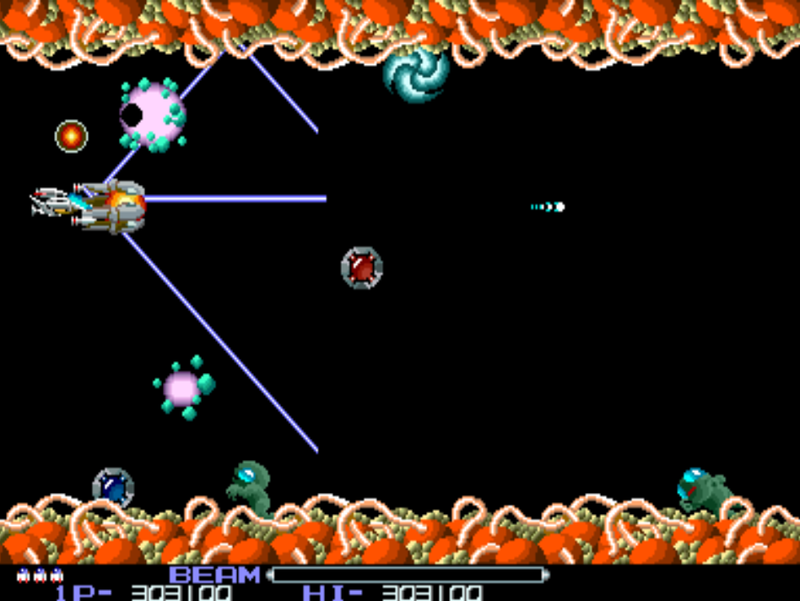 Like most shoot-em up games, Shot is a weak, but quick firing weapon with very little screen coverage. It is very difficult to progress deep into the game using only this weapon. Thankfully, the game is fairly bountiful with providing weapon power-ups, so if you do find yourself flying naked and trembling (as shown above), you normally only have to survive for a short time before Mr Power-Up will hop onto the screen, offering you a slice of salvation. The weapons are not referred to by name within the game itself, so the names shown below are just what I have always referred to them as. As already mentioned, there are three 'special' main weapons. They can only be fired when a level 2 or level 3 'Force' is attached to your ship. This means that each special weapon has two levels of power. The laser weapon equips your ship with three, blue, multi-directional firing lasers. One laser beam is fired directly out of the nose of the ship, whilst the two others are released at 45' angles above and below respectively. These lasers bounce off solid surfaces and objects, sending them careering around the screen. Any enemy that can take damage, will absorb the laser. Hence enemies hit by the laser do not cause it to richochet. 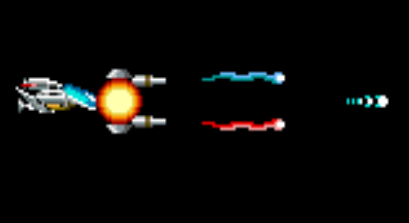 As you can see by comparing the two images here, when you reach power level 2 with this weapon, the length of the laser beams is significantly increased. 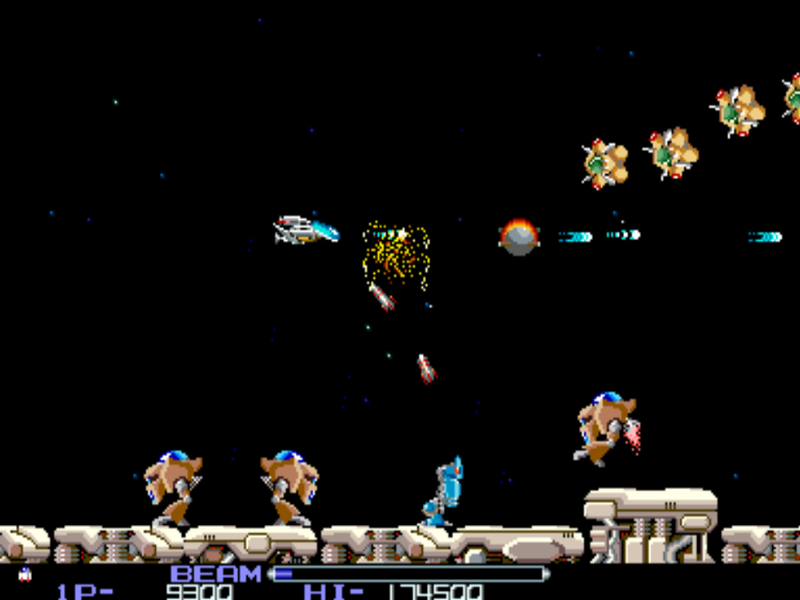 The range however is not affected; rather there is 'more laser' on the screen at any given moment, increasing your chances of hitting enemies (and increasing damage against larger opponents). 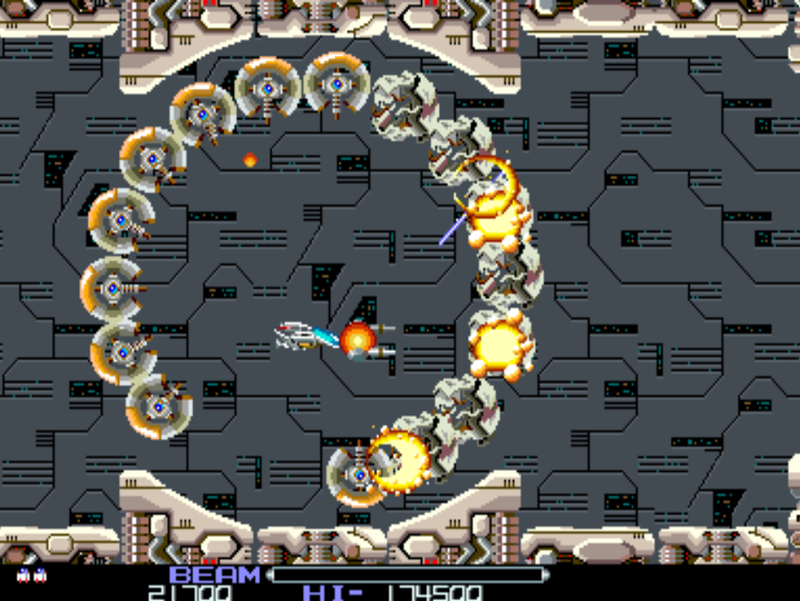 Laser is probably the best all round weapon in R-Type, at least for the average player. Its ordnance will cover the most screen real estate and it does a decent job of ricocheting off the scenery and hitting enemies that are behind you, which is extremely useful. Also, because two of the lasers are fired outwards at an angle, it is very useful for laying down fire against enemies without actually being directly in front of them. It also has a great sound effect! The weapon I call 'Ribbon' is arguably the most powerful weapon in the game. However, I cannot back this up with evidence. But it certainly has the most concentrated form of fire. At level 1 (which remember, means you have a level 2 Force attached), two short ribbons of fire are released. (See image below left). At level 2, this is upgraded so that they intertwine and create a flowing set of 'rings'. The initial part of the rings immediately in front of the ship are wider and then just after this point, they reduce in size. A good thing about this weapon, is that because the initial size of the rings is quite large (significantly wider than your ship and Force pod) - it can be used very effectively for shooting enemies that are directly above or below you. This is especially useful for those enemies that can soak up a lot more damage before being destroyed. 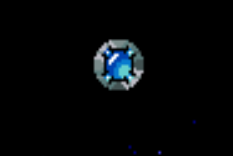 Using this weapon, you can position yourself just above or below the enemy and ensure that the wide part of the rings is clipping them, doing them damage. One unique aspect of this weapon, is that if you have at any 'Bits' equipped, they will also fire a level one ribbon of energy for free! (Look again at the image above right). No other weapon provides you with this free-bee. If you have two Bits equipped, both will fire. The upper one always fire a blue ribbon of energy and the lower one will fire a red energy ribbon. (If you are equipped with 'Laser' or 'Snake', the Bits do not fire, they are merely your protectors. 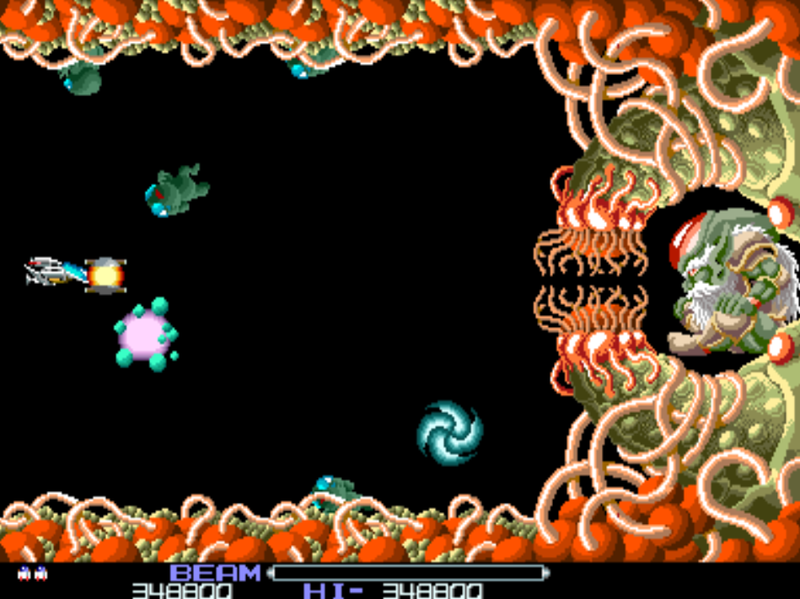 The Ribbon weapon excels on level 4 where it obliterates the green algae type blobs that litter the level. No other weapon can match the concentrated damage output of this weapon and so it is very good at taking down high hitpoint enemies. Snake is a weapon that first becomes available at the start of Level 2 of the game. Fiery plasma balls are released vertically from above and below your ship. These travel upwards and downwards to the sides of the screen and then flow forwards along the scenery until they hit something that can take damage. If there is no scenery above or below the ship, the ordnance will just fly directly off the screen and disappear. If you have the Force attached to the rear of your ship, then after the Snake leaves your ship, it will instead flow from right to left along the scenery, heading backwards along the scenery. At power level 1, three fiery plasma balls are released above and below your ship (see image on the left). At power level 2, the weapon's output is doubled. Six plasma balls are ejected from your ship on each side. (See image on right). The clear advantage that this weapon provides, is the ability to take out enemies and static structures that are anchored to, or move along the extreme top and bottom edges of the gameplay area. It also offers you the opportunity to hit enemies that would otherwise be out of your line of sight, by flowing around objects to reach the target. Unfortunately, the problem with the snake weapon is that it is not very fast firing, and for this reason, dispatching enemies can often take a tad too long. 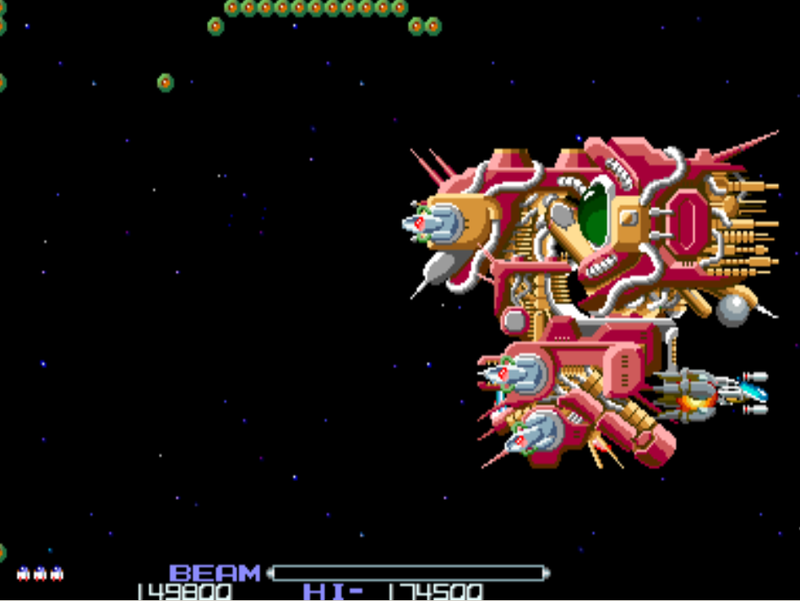 When Irem released R-type 2, they significantly increased the speed of this weapon, which to me is a decent indication that it is underpowered in this game. It's other weakness is that when you are equipped with this weapon, you are left firing only 'Shot' as your main forward-firing ordnance; and this is rather weak and often not enough fire power, especially later in the game. 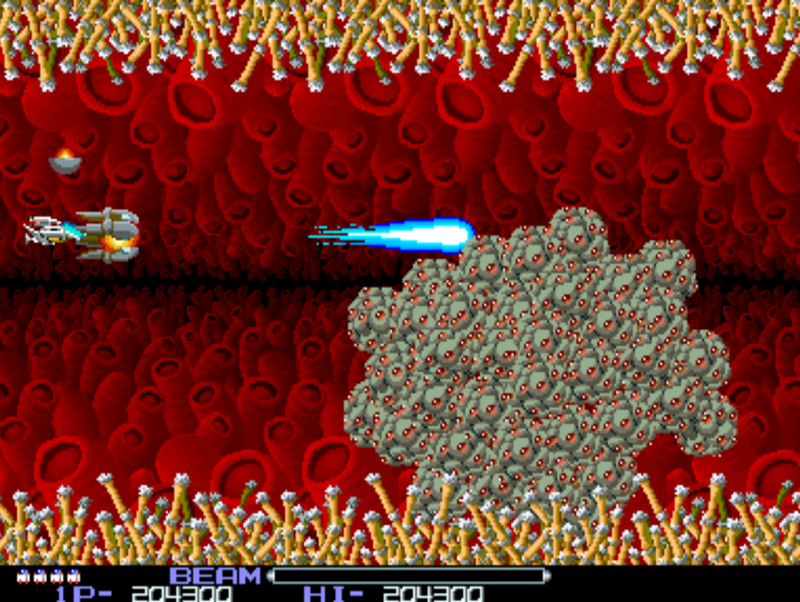 Aside from the three special weapons, R-Type introduced another great gaming innovation. The 'beam'. At any time (no matter what weapon is equipped) you can choose to hold down the fire button and 'charge up' a powerful plasma beam weapon. This 'beam' has the power to destroy multiple standard enemies at once, or can be used to apply greater firepower against larger enemies who possess more hit-points. 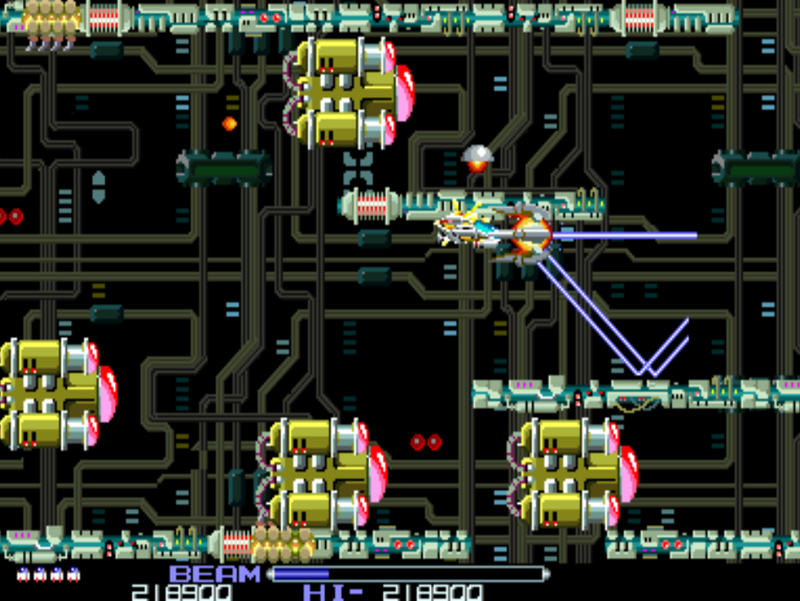 At the bottom of the gameplay area, immediately above the score display, a graphic displays the current state of the beam weapon. (See below). When you are firing any weapon, the beam will be charging and discharging very rapidly (because you are also releasing 'shot' ordnance). This means that effectively, beam is an extension of the 'Shot' weapon. We established earlier that your ship always fires the Shot weapon, regardless of the Force or weapons attached. Therefore, 'Beam' is always available. 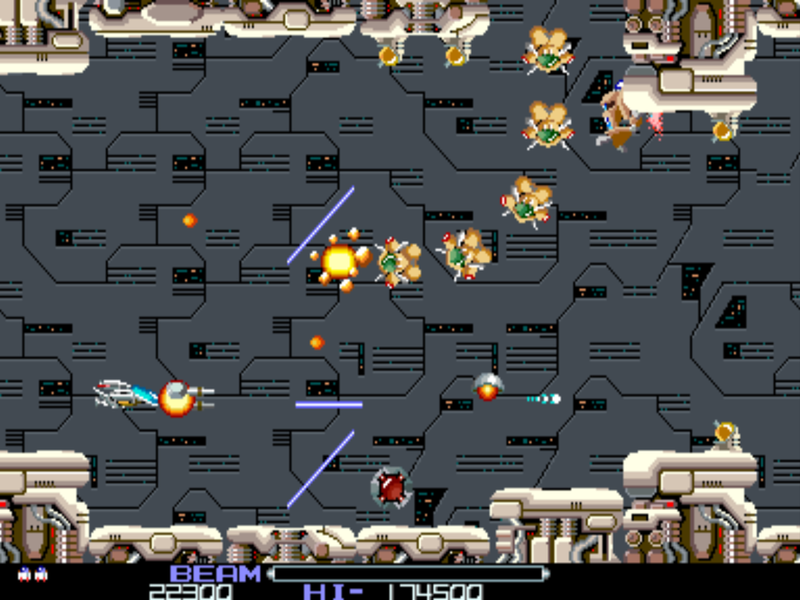 To 'charge up' the Beam weapon, the player must hold down the fire button. 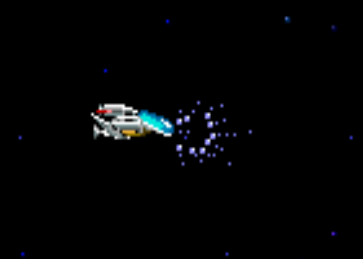 When you do this, the blue bar at the bottom of the screen will start to fill up and sparks will begin to emanate from the front of the player's ship. The longer the blue bar is, the more powerful the beam will be when you release the fire button. Once the beam-bar is fully filled, it is charged up to its maximum and it will stay that way until you release the fire button. As the beam rips through enemies, it will diminish in size until it is completely absorbed. The usefulness of Beam tends to grow in tandem with your experience in playing the game. There are many situations when a beam release is the most effective way of clearing an area or destroying multiple enemies. It is very effective against stronger enemies who have larger hit-points and can also be very useful against Bosses. Creative use of the Beam weapon can often get you out of sticky situations. Often, a full beam release is unnecessary. Just a quick, partially charged beam is all you need. The Beam weapon is unchanged by the Force or Bits and always operates in the same way. As if the Force wasn't enough - your R9 ship can also be equipped with up to two special side pods, called 'Bits' ! 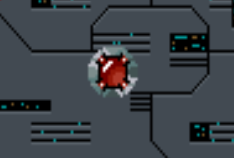 These 'Bits' (which are named as such in Irem documentation) are spherical orbs that position themselves just above and below your ship, providing additional protection. The first thing to note with Bits, is that all enemy fire will pass right through them! - Hence you cannot use them to block bullets coming your way. Furthermore, unless you have the Ribbon weapon, they do not fire anything either! Because of this, you may be forgiven for wondering what use they have! But do not despair! Despite these shortcomings, Bits are incredibly useful for one main reason: They destroy on contact, all 'normal' enemies. Furthermore, just like the Force, any enemy they touch that is not instantly destroyed will begin taking damage from them. 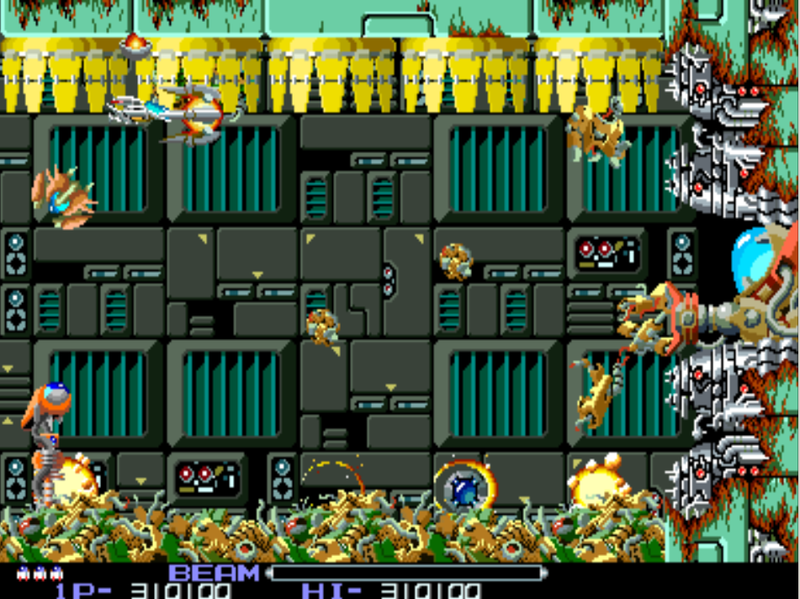 Some enemies (such as the crabs on level 2) also have their movement impeded by them when touched. Once equipped, there will be countless times when the Bit (hovering above or below) will take out enemies for you, simply by them touching it. If you manage to get two Bits, they can a make an amazing difference. Use your Bits to 'mop up' enemies that are floating around the screen. The one unfortunate thing about Bits, is that they are comparitively rare in the game. In fact, only three are ever provided throughout the games' eight standard levels. A 'Bit', ready for collection! As you can see, they are infrequently available. Because of this, dying when you have one is always something of a loss, since unlike a Force, you cannot easily replace it. Bits are incredibly useful on Level 4, since they wipe through the green blobs with ease, clearing a path and creating space to manoeuvre. 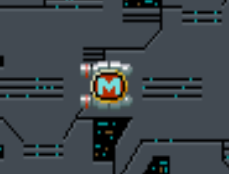 Bits are obtained from a normal looking 'Mr Power-Up' enemy. Fly over the dropped Bit, to attach it to your ship. The first Bit will always attach to the upper side of your ship. If you manage to get a second, it will attach underndeath. Bits are completely independent of the Force, so it is possible to have them attached to your ship, without having a Force. Remember, that enemy bullets pass right through Bits! - But anything else that can be physically shot with a weapon, will be absorbed, damaged or destroyed by a Bit. 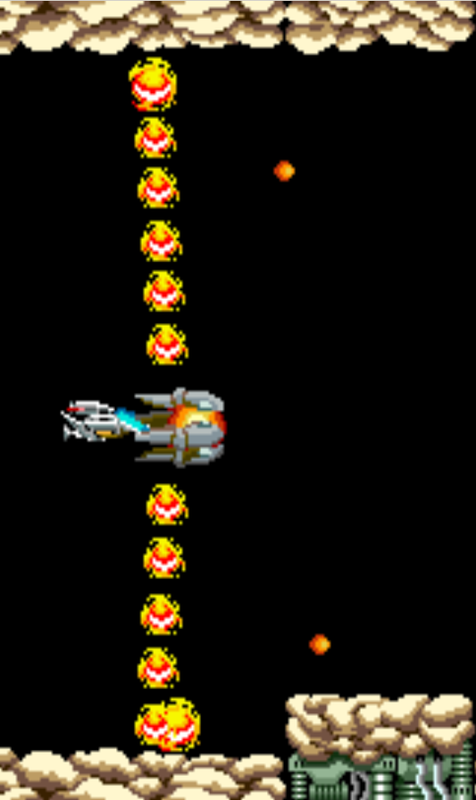 For example, the snake on level 2 'fires' its red segments at you. These can actually be shot by your weapon and hence absorbed by a Bit. 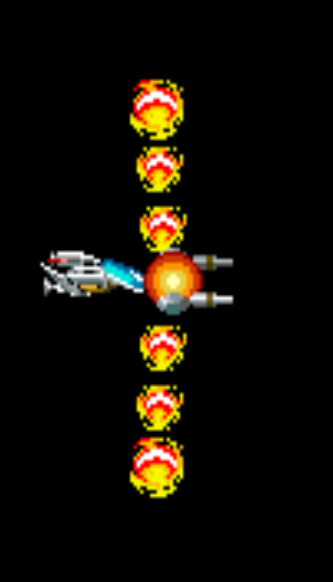 'Mr Power-Up' as I call him, is a non-firing enemy that frequently appears throughout the levels in R-Type. It is he that provides you with all your power-up goodies! When killed, he will drop one of five possible different power-up icons. It's worth noting with this enemy that the power up he drops is always predetermined. There is no random element to it. Consequently, through experience in playing the game, you will always know what power up is going to be coming up. When you collect a speed-up icon, the speed of your ship is immediately significantly increased. There are a maximum of four speed-ups that you can apply to you ship at any one time. When you pick up a speed-up icon, a burst of blue plasma emerges from the rear of your ship, confirming the speed boost has been applied. Initially, speed-ups are fairly uncommon. Only two are provided across the entire first three levels. However, after this point, they become much more common. Personally, I find maximum speed to be too fast. 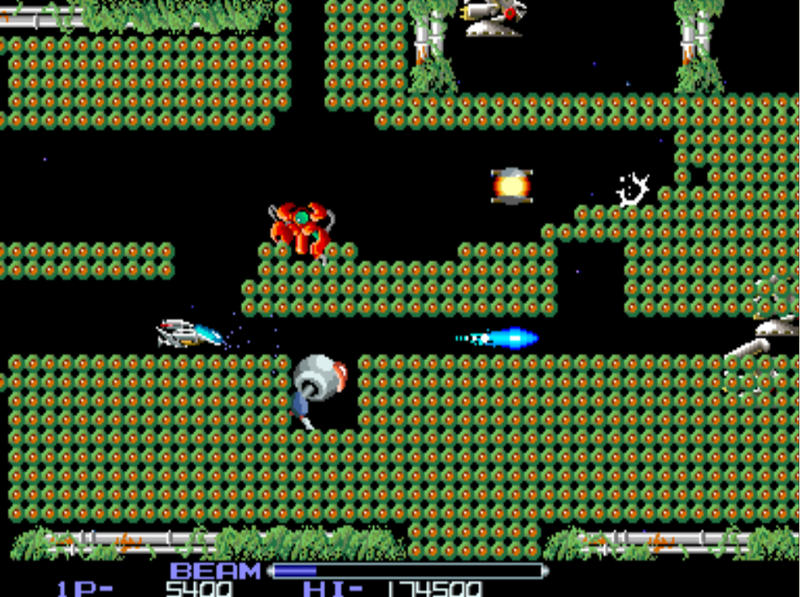 The slightest twitch of the joystick provides a lightning response from your R-9 craft and this can cause you difficulty when trying to make small, accurate position adjustments which are often required (level 6 is great example of this). Two or three speed-ups are best I think. Interestingly, the faster your ship becomes, the greater the inertial 'lag' effect is, with regards to your Bits. At full speed, if you fly the full width of the screen, your Bits are half a screen's width away by the time you reach the other side! I have performed some analysis of the speed increases you get with each speed-up icon you obtain. The approximate timings below display how long it takes to traverse the full width of the screen. Note that speed is unaffected by the Force or Bits. It is also unaffected by having a Force attached. Since the R9 always stops shot of the very edge of the screen, to allow a Force to be accommodated, should you have one. Any Speed-Up collected after you already have four, has no effect. Although you will always be given 400 points! 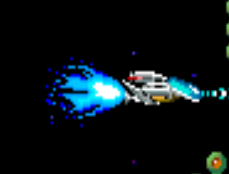 When you pick up the missiles power-up, your ship will automatically begin firing two reasonably well guided missiles. These are linked to your main fire button and so do not require separate firing. If you are hammering the fire button, two of them will dispatch themselves from your craft around every 2.5 seconds. Interestingly, they will still continue to fire even if you are holding the fire button down (when charging up a beam release). If this is the case, they will fire around every 3.5 seconds instead. Missiles are unable to track backwards from their current position and if there is nothing for them to hit in front of them, they will simply fly off the screen - this means they will disregard any enemy that appears behind them. It seems to me, that missiles only possess one level of power. So picking up multiple 'Missile' power-up icons, attaching a Force, having Bits - all seem to have no effect on the weapon's output. 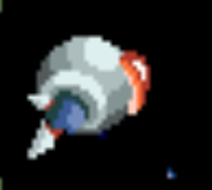 You can see in the image below one of the missiles hunting a Mr Power-Up on Level 5. 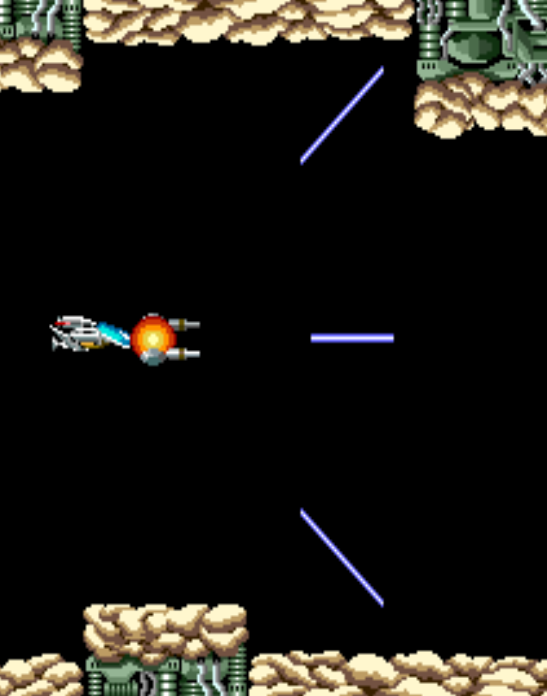 Because he is the only enemy on the screen, the remaining missile is simply flying off into the sunset. Missiles do not pack a great deal of strength, but what they do do very well, is continually take out the weak enemies that maraud around a level. This, coupled with the fact that you do not need to sacrifice anything in order to use them, means that getting and using missiles is a no-brainer. Ahh..so here we go with actually playing R-type! From the moment you begin, you will appreciate the quality it exudes. The first thing you will notice is the music. 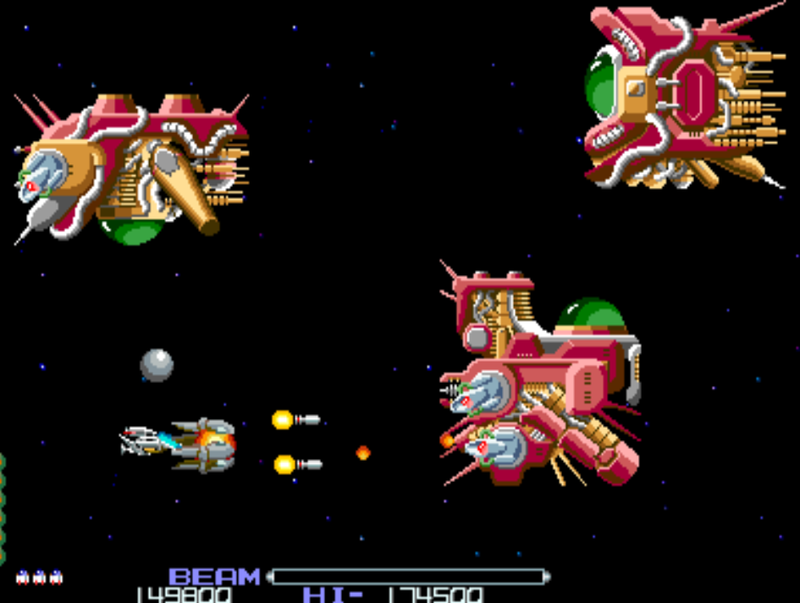 It's not too bombastic or over the top and it isn't just a mash of non-descript noise like many shoot 'em ups are. It's artfully done. Then you will notice the sound effects. Clear, crisp, meaningful and enhancing. When you fire your weapon, when you hit an enemy, when you charge your beam, when you release a laser. Every sound in R-Type is well designed and enhances the experience. Level 1 is a lovely introduction to the game. It's not too difficult, it introduces some basic enemies, it gives you the 'Force' pod, the 'Bit' side pod and both the Laser and 'Ribbon' weapons. It also makes a good attempt at trying to get you to use the Beam weapon by throwing a couple of high hit-point 'jetpack men' at you. The Force is provided quite early on and this allows you some decent time to get used to using it. Using the Force effectively is the key gameplay element that any new player must focus on. You will realise almost immediately, just how important the Force is. Because it is indestructible and can absorb any amount of normal enemy fire, you can use it like a 'bullet hoover' - running into enemy fire with it, and removing them from the screen. It also means you can maintain your ship position in order to shoot something, whilst letting the enemy fire just absorb harmlessly into your Force. The Force is also brilliant for just ramming into normal enemies, which will die on contact. Learning how to use the Force more effectively should be one of your long-term game aims. The enemies on Level 1 are slow moving and fairly ponderous, so they should not pose much of a threat. However, any enemy that you do not destroy that flies past you off the left of the screen, can still fire backwards towards you; so you should always be aware of this (and for this reason, it is good practise to keep the number of enemies flanking you as low as possible). Everyone loves the R-Type carousel! A special mention must go to the clarity of the enemy fire. 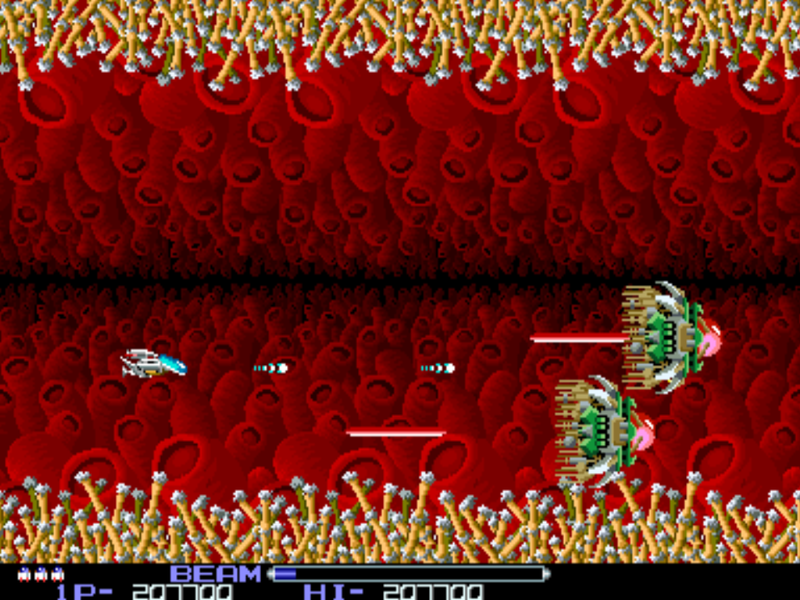 In R-Type, bullets are beautifully clear and this is something that I really appreciate. Because I suffer from a bit of colour blindness, not being able to see bullets in games is a real headache! (If you can't see them, you can't dodge them!) But have you ever seen clearer enemy fire than this? It's wonderful! Overall, there are no really tricky sections on level 1, so as long as you don't do anything silly, you can just smile and relax your way through this early part of the game. By the end of this level, you should be equipped with the Force, one Bit, one Speed Up and either full power Lasers or a full power Ribbon weapon. You should also have 'missiles'. In total, three weapon power ups are dropped on this level. Level 2 is an organic looking level. The background looks like some cell wall structure and the top and bottom of the screen is adorned with organic matter and hides most of the enemies that come out to attack you. This level is definitely a slight step up from Level 1. However, it's not manic and being equipped with a Force, you will for the first time really appreciated how useful it is; letting much of the fire directed at you, simply be absorbed into it. The main enemies on this level look like a cross between crabs and scorpions. They fly directly across the screen from time to time; coming out of the both the top and bottom of scenery sections. So be wary of them. You can see the tips of them lurking in the scenery. However, before they move, they perform a little shuffle, so you always have advance warning before they move. A full power beam release can destroy two of these crabs simultaneously. Note that the crabs possess higher than average hit-points and so will fly right through your Force, before it has time to destroy them. Level 2 features crab-like creatures and flowers! Level 2. R-type loves a snake! This level is probably at its trickiest when the flowers pop up and start releasing their fire. These flowers can be a bit annoying because they are fairly robust and have quite a lot of hit-points. Once you are past the flowers, the most difficult part of the level is behind you. Generally speaking though, it's all relatively comfortable stuff. This level also introduces both the 'Snake' enemy and also the 'Snake' weapon! As mentioned in the weapons section above, I think the Snake weapon is underpowered and I prefer to stick with Lasers or Ribbon. Remember, if your ship touches any part of the top or bottom scenery, you will die. So steer clear! Power-ups provided on this level: 1 Speed-Up, 1 Snake weapon, 2 Laser weapons. 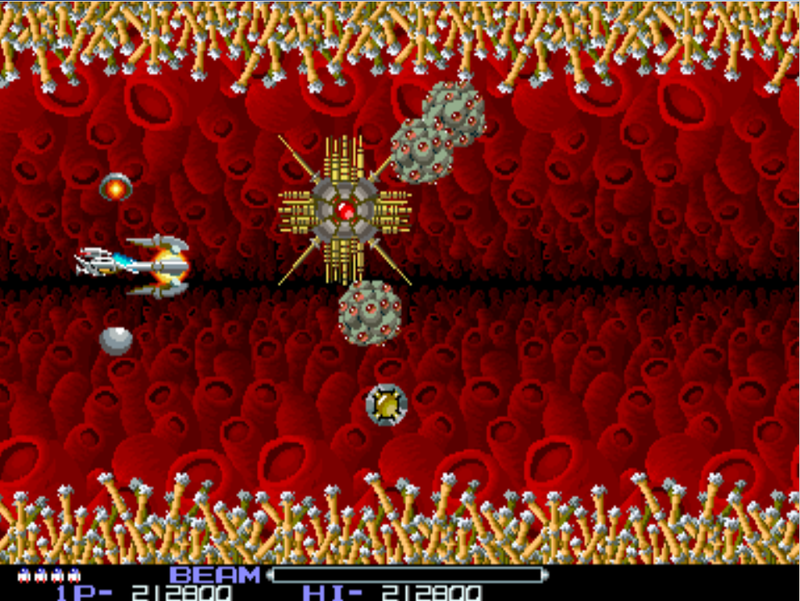 Level 3 is unique in R-Type in that it consists solely of the boss. - And what a boss this is! I can still remember the first time I saw this in the arcades; I was blown away! The sheer size of the enemy ship that you have to negotiate was eye-popping and for it's time, this was pretty groundbreaking. What's great too, is that the enemy ship is packed full of detail and design elements. It's size and complexity actually makes the game slow down at some points during this level, as the processor struggles to deal with all the detail. 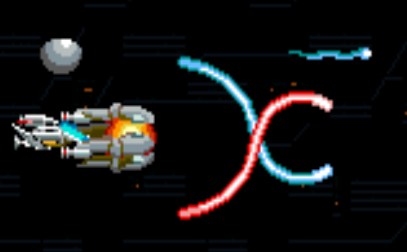 The exhaust jet which you encounter right at the beginning of the ship (see image on the left) shoots out white plasma type balls. These will penetrate your Force pod, so be prepared to dodge these. The easiest method for destroying this exhaust jet is to fire your Force into it. However, if you do not completely destroy it, after a few hits, it will detach and self destruct after short period. It's worth noting that whilst the large exhaust jet is firing (as shown above) it is invulnerable to any damage. Once you deal with this first section, you will move to the lower half of the ship and begin moving underneath it. 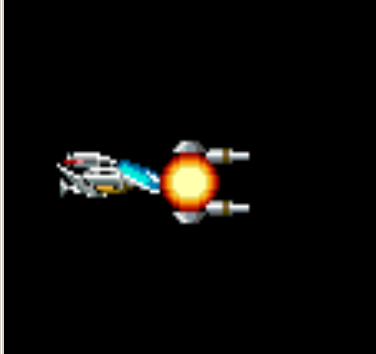 One piece of the ship detaches and fires heavy lasers, so be sure to avoid those as they will penetrate your Force. Next up are the beautifully designed thruster jets that move and fire periodically. If you get caught in the blast of these when they fire, you will be destroyed. Full Beam releases are a good way of dispatching these. As you destroy them, they become damaged and then start puffing and working erratically. Brilliant design! The game is fairly kind here because a Mr Power-up appears during this section and drops a Ribbon weapon icon. The Ribbon weapon is great for laying down concentrated fire on the jets and remaining turrets. As you then begin to move around the front of the enemy ship, it's best to detach your Force from the front and re-attach it on the rear. 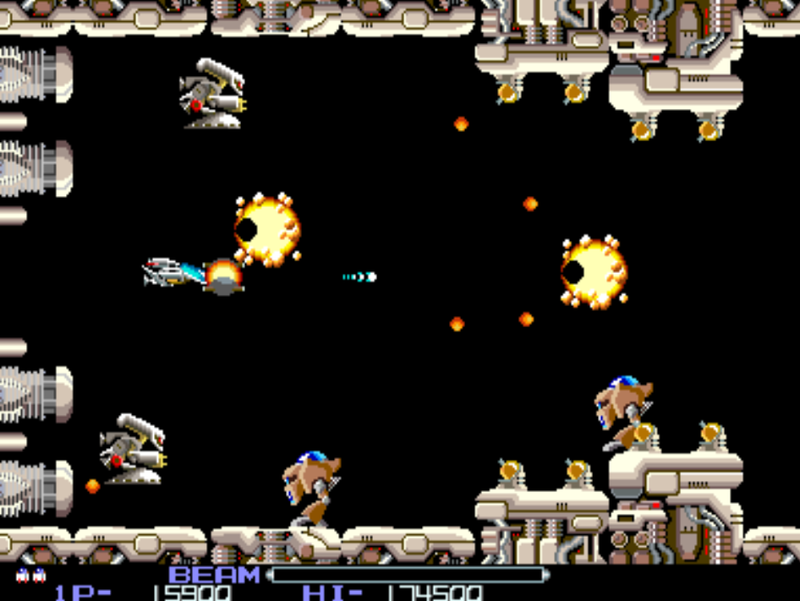 The turret emplacements at this point (you can see some at the bottom right of the above image) will shoot fiery plasma shots at you and because you are forced fairly close to them (you will be quite tight against the right hand side of the screen) - care must be taken so that you're not caught out by these. As they turn to aim at you, there is a delay before they actually fire; however because the game sometimes struggles to maintain a smooth frame rate here, it is entirely possible to be caught out by them. Then it's over the top and to the final portion of the ship (see image on left). A mechanical looking pneumatic type pump oscillates in and out, firing a spray of bullets as it does so. Then it stops firing and reveals it's weak 'eye' - which is the portion you need to hit. The standard way of doing this is to wait for it to fire its flurry of bullets (which you get no points for shooting) and then move in for a full Beam release. This will destroy the boss in a single shot. Alternatively, you can use the Ribbon weapon and kill it without even having to move down into the gap. The same can be done with the Laser weapon too - although this is a bit more fiddly to hit the eye with. Note that you are not awarded any points for destroying the bullets that are sprayed out. As a bit of fun, it's possible to actually go down and position your ship directly in front of the eye (with the rear of your ship tight against the back of the space). You can actually sit there and not be damaged - although it does require you to make constant slight adjustments to your position, because the enemy ship does move around slightly. Because of this, there is one final challenge for you here....it's possible to complete this level without firing a single shot. It's pretty difficult, but can you do it?! 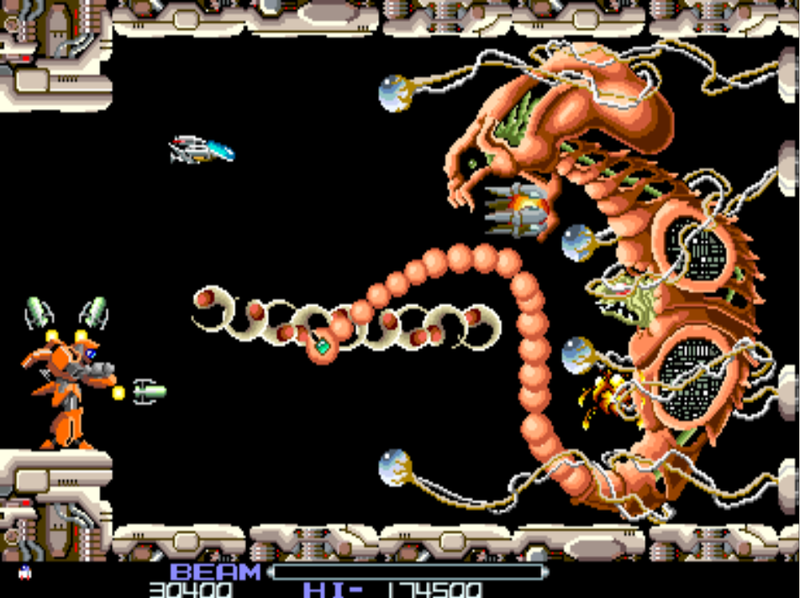 One of the criticisms that some people had of R-Type, was that the game sometimes punished you, not because you were not a good player, but simply because you did not know the levels, and you had to learn them. I think this criticism is slightly harsh since to a significant degree, nearly all games are like this. However, having said that, for the first few weeks that I played this game in the arcades, I remember thinking that this level was impossible! But then (like everything) you practise and you play it more and more, you learn the layout of the level, the movements of the enemies and after a time, it becomes fairly simple! To me, this is the first point in the game where you really feel the need to move your Force back and forth from the front and rear of your ship. And doing this is both fun and rewarding. Due to the nature of this level, you may find it will take you a few play throughs of this level, to get a firm grip on the enemy movements etc. If you touch any of the green blobs with your ship, it will be destroyed. So it is important that you do not get boxed in. Ribbon: The weapon of choice for level 4! If you are equipped with Laser on this level, the beams will just bounce off the blobs, making them impossible to destroy - which is pretty useless. If you have the Snake weapon, it likewise treats the green blobs as scenery and so the weapon will just flow around them. Again, not much use. Your standard Shot weapon will destroy the blobs, but it's hard work and fairly slow. For this reason, the best weapon to use here by far, is the Ribbon weapon. Swathes of green are cut asunder using this, easily creating lots of space to manoeuvre. Full power Ribbon is obviously best, but even a level 2 Force with Ribbon easily cuts through the green slime. The previous level gives you a chance to collect the Ribbon weapon, so it's best to keep it as you complete that previous boss. However, even if you arrive at this level without it, the first part of the level is perfectly survivable without it and Mr Power Up soon appears and duly provides you with it. On this level, you should make good use of your Force. Attach it to the front of your ship and drive hard into the blobs to clear them away. Put it on the rear of your craft and do the same. Alternatively, attach your Force and fire it off from your ship! This also obliterates any blobs that are in the way. If you have a Bit attached, again, make good use of it! Use it to clear the blobs from the screen above you. It's great for creating more space for yourself. 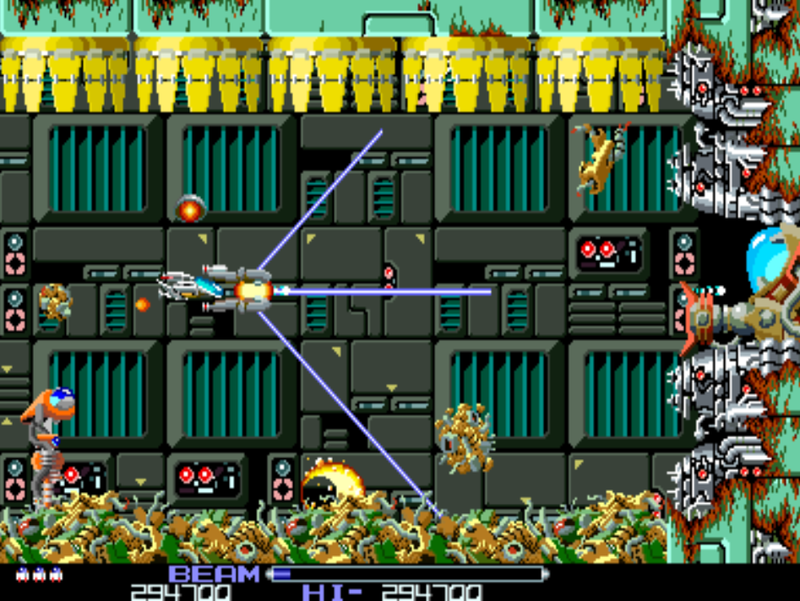 The Beam weapon can also be incredibly useful on this level. Charge it up and release it to cut through the blobs and clear any enemies in your path. You do not always need to release full power beams either; especially if you are stuck without a Force. Just release some smaller quicker beams and it will greatly help you to clear a path. There are two key moments during the level, where you really need to move your Force and attach it to the rear of your ship. Once you play the level a few times, these points will become clear. One of them is shown in the image above. It's worth noting that it isn't necessary to move the Force here, (you could just try and fly directly back between these enemies) - but it certainly makes life easier. If you happen to have two Bits attached here, it's possible to move diagonally forwards (either up or down) straight through the green slime with impunity! All things considered, level 4 is awesome. It's fantastically designed and really fun to play. I'm likely not alone in saying that this is probably my favourite level in the game. Level 5 is quite similar thematically to level 2. However, the top and bottom of the screen is flanked by what look like, coral polyps. It's another great level to play. On the whole, I would say that this level is actually more survivable than level 4 - certainly for an inexperienced player. There are no complex patterns to learn, rather you just need to be on your toes! There are some new types of snakes to deal with (see image on left) and there are a couple of sections where 'Force-penetrating' lasers are fired by a few different enemy formations. The new snakes can be destroyed by a good sized beam-hit to the head. 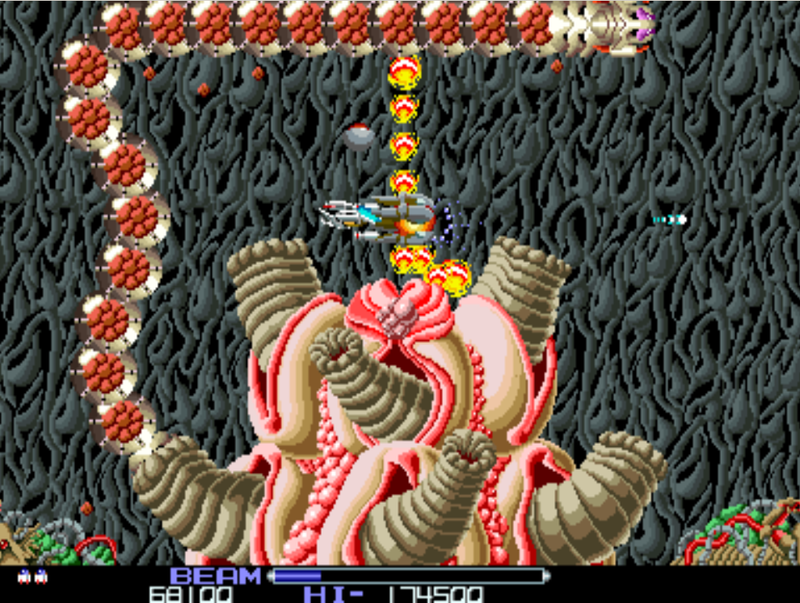 However, when the head is destroyed, their bodies split into segments and fan out, flying off the screen. So you must avoid these pieces or shoot your way through them (which isn't too tricky). The segmenting snakes are pretty cool I think. Alternatively, you can actually just avoid a lot of the snakes and not shoot them at all; letting them weave their way around the screen and disappear. The Force-penetrating laser firing enemies are fairly comfortable to move through, so long as you remain calm. They come in several short-lived waves, but there is always room to position your ship within a safe space vertically. I think that there are two aspects which can make this level tricky. Firstly, this level provides quite a few speed-ups. Now depending on what level of speed-up you already have, it's quite possible to get to full-power speed on this level - even when you don't want to (because you may be dodging enemy fire etc and accidentally pick some up) - and at full power speed, it's very difficult to accurately control your ship. Secondly, there are some fairly fast moving enemies that fly in from the top/bottom of the screen. These nifty little buggers seem pretty innocuous at first; but can quite easily catch you unawares as they emerge from the polyps. They fire fairly rapidly as well; so you must stay alert to avoid these. You are most at risk from these during the laser-firing enemy formations; as you will be concentrating on avoiding the lasers. (See image on the right). One of the unique aspects of this level, is that you can fly fully into the top or bottom scenery and not die; - which is pretty strange considering every other level in R-type punishes you with death if you touch the scenery. However, knowing this is pretty handy on this level, as it significantly increases your manoeurvering room. (You can still be hit by enemies that fly in from those edges though - so be aware!) In fact, the screenshot above is a great part of the level where flying into the top or bottom of the scenery makes for a very handy way to bypass these nasties! It's worth remembering too that enemy bullets pass right through snakes, so you can't use them as a shield! 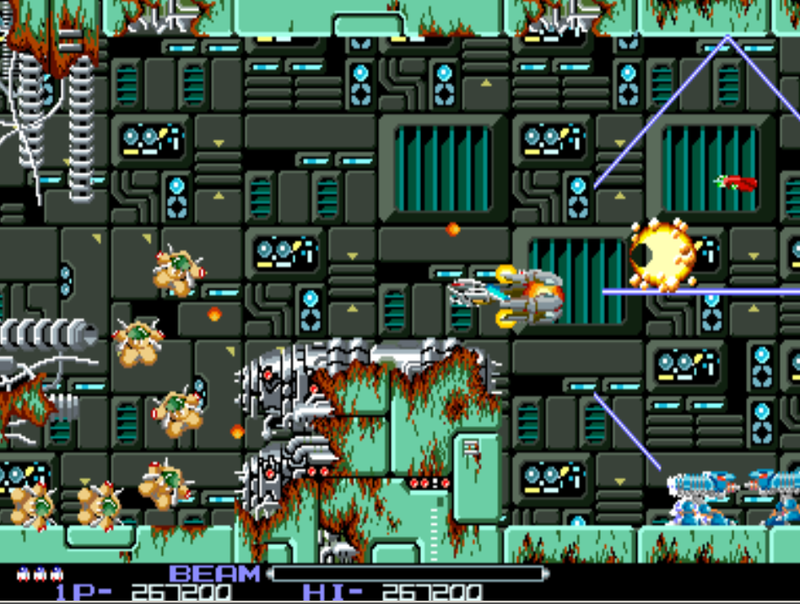 In terms of power-ups on this level, the game provides you with several speed-ups and also the Laser and Snake weapon. Should you die, you can get yourself back up to full power Lasers or Snake. However, I think the best weapon to have on this level is 'Ribbon'; but since it is not provided, if you still have it equipped from level 4, I recommend you keep it. Level 6 is all about how you position and move your R9 ship. You must be on your toes at all times and constantly dodge a series of ships that move around the level. It is this level above all others which probably punishes the player for lack of level knowledge and is the cause of many of the complaints players had against the game - namely, it's not about being good, it's about knowing the level. I think for this level, this is fair comment. It would be extremely difficult for a player to get through this level on their first attempt, as there are several sections that are likely to catch you out - simply because you would not be able to anticipate the movement of some of the ships. However, having said this, I think this level is a brilliant piece of design. It consists of lots of industrial looking barriers that serve to hamper your movement, whilst you fly over what looks a bit like a printed circuit board. Few other enemies appear...but these do! Level 6 is all about movement - in every sense! 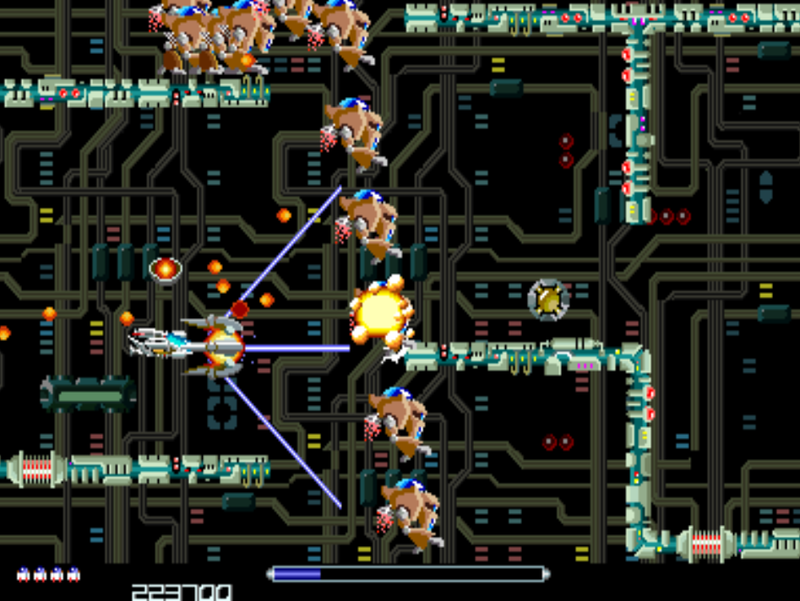 The level is nearly totally dominated by the ships shown in the image above. They look very similar to the parts of the boss from the end of level 4. These ships are constantly flying onto, and off the screen and you must dodge the majority of them (as their vulnerable pink spots are facing to the right). As these ships fly around the screen, there is always room for you to position your ship between them and a barrier, however it's often a tight squeeze and knowing where to position yourself is half the battle. There are not many other enemies on Level 6 - and that's probably a good thing! However, there are some little 8 legged segmented enemies that move along barriers. These will occasionally fire at you (you can see two of these in the image above.) You should keep one eye on these little critters and wherever possible, take them out. The few bullets they fire can often cause you a problem as you try and keep yourself tucked against an edge to avoid the marauding ships. 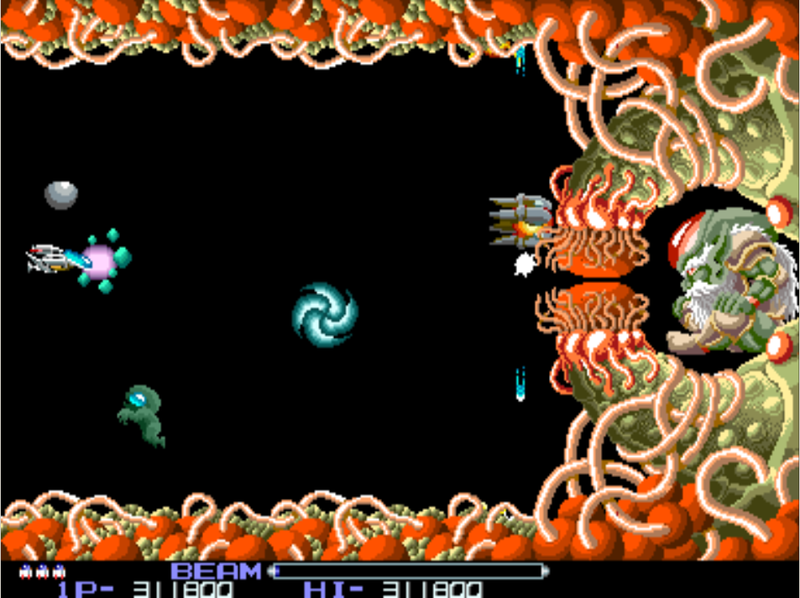 There is no doubt if you start playing R-Type again today, you will die repeatedly on this level. Over and over and over again. Take heart from the fact that everyone did! During the 1980's when I played this in the arcade, this level was always as far as I could get (only playing one credit remember). But the more I play it now, the more I do love this level! Like lots of other games, it's about learning a pattern with this level; and executing the pattern accurately can actually be quite rewarding. There are a few things about this level that make it tricky. Firstly, parts of the scenery spontaneously explode. There is nothing you can do to prevent this and if you are caught nearby when it happens, you will die. Your best bet to avoid these explosions (aside from gaining experience as to where and when they happen) is to try and stay away from the top and bottom edges of the screen. 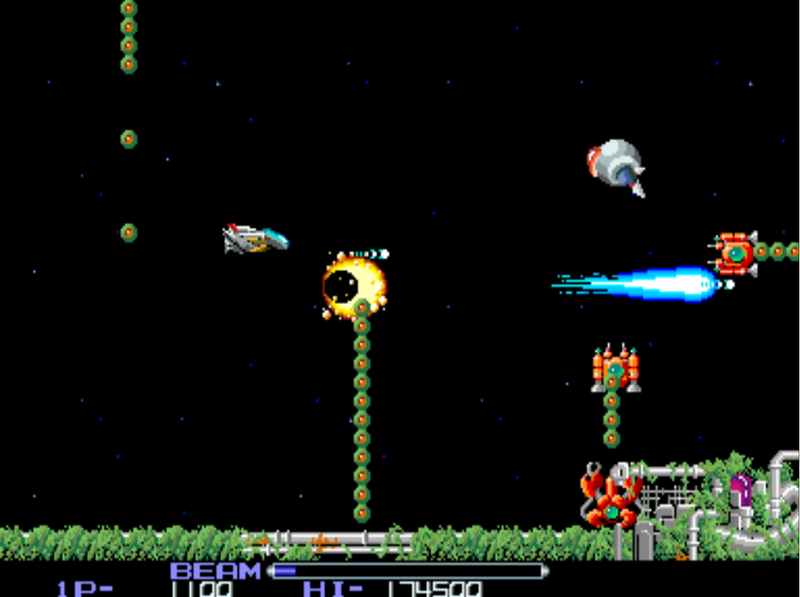 Secondly, quite a lot of firepower (and enemies) are levelled at you from behind your ship. This can cause you quite a headache and you should constantly be on the lookout for this occurring. 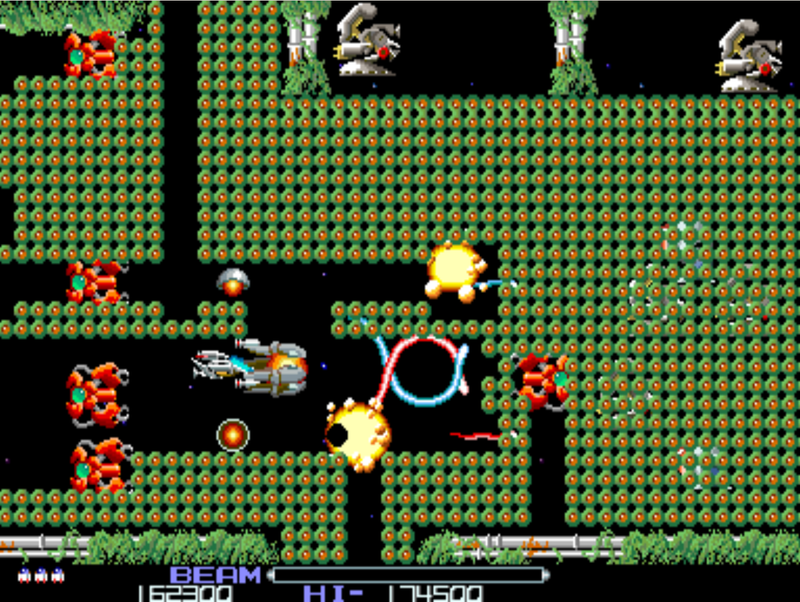 If you have the Laser weapon, bounce them off the walls to shoot the enemies behind you, or reposition your Force. Alternatively, try and use the walls to your advantage. Since enemy fire will not penetrate them, you can hide behind them and use them to help shield you. The image above shows the slightly odd rectangular type alien that follows you slowly across the screen for a time. He doesn't have to be destroyed, but he is something of a moving road block, getting in your way and reducing your manoeuvrability. He's a strange enemy. He does not fire. He does not 'light up' when hit by any weapons fire (although the game does register your shots with the normal sound effect). His main purpose (I think) is to force you around to the edges of the screen - where you can easily get caught out by the exploding walls. If you look again at the image above, you can see a part of the scenery exploding at the bottom part of the screen. This is what you are looking to avoid. This 'junk pile' enemy has a lot of hitpoints but can be destroyed if you keep hammering away at him. However, if you do not destroy him, he eventually comes to a stop and you will leave him behind. Well after playing through seven fantastic levels, level 8 is definitely a disappointment! To me, it almost feels like the programmers were suddenly told to create a new level - after they thought they had finished designing the game at level 7. Or perhaps they had already created an 8th boss, but didn't have a level to go with it. Either way, level 8 is the simplest level, a fairly easy level and also (by far) the shortest level. This wouldn't be so bad if it wasn't so very dull. The background is plain black. There are no structures or mapping elements and there are only two types of enemies. Maybe I'm being a bit harsh, I don't know. I can perhaps envisage that the programmers saw this as being less of a level and more of just a long approach to the final boss. Anyway, there are only two enemies to encounter on this level; and they are both a bit rubbish. Firstly, there are what look like little babies in spacesuits floating around. 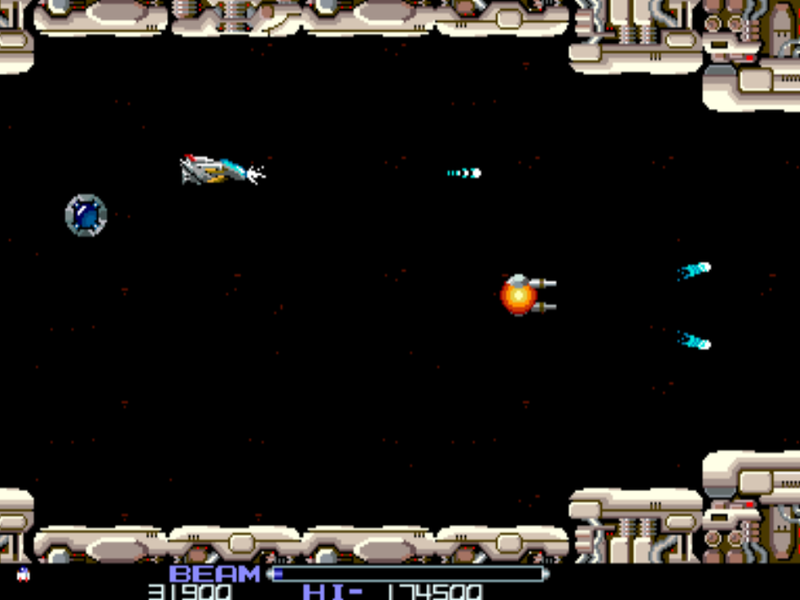 And secondly you have a 'whirlwind' type enemy that just floats around the screen constantly. Neither of these enemies fire. Hardly the most exciting of foes! It's something of a let-down; especially after having played through so many amazingly designed levels to reach this point. As mentioned, the length of this level is also a bit odd. It's approximately half as long as any other level in the game. Mind you, perhaps this is a blessing! In terms of actual gameplay, although this level is not terribly difficult, you still need to be on your toes, since the space-suited babies do fly onto the screen constantly, and they are fairly fast. As mentioned, they never fire, so that uncomplicates things a bit. Every enemy type you will encounter in Level 8! After a short while, the level will stop scrolling and you will arrive at the 8th and final boss (which is difficult). Ah, bosses! 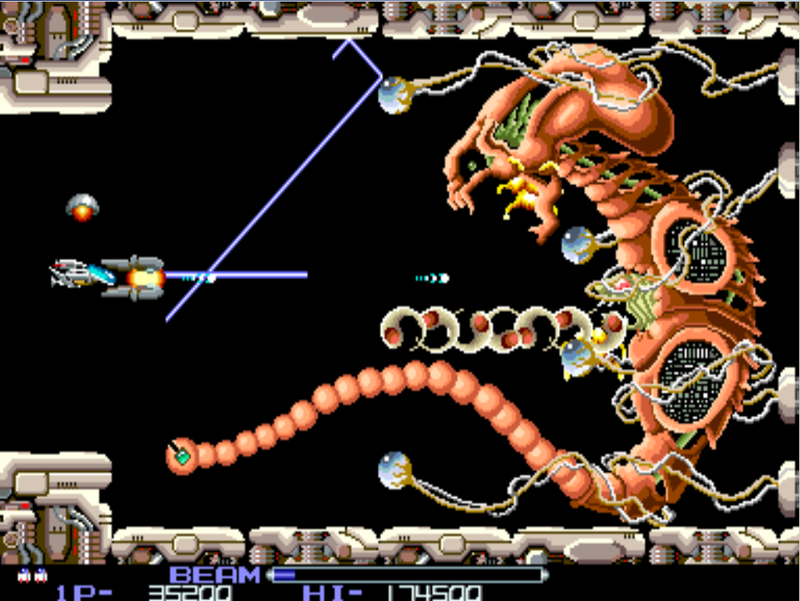 All arcade game players love a good boss and R-Type has them in spades. All of them are different, all are big, bold and graphically interestingly and all have unique aspects to them. 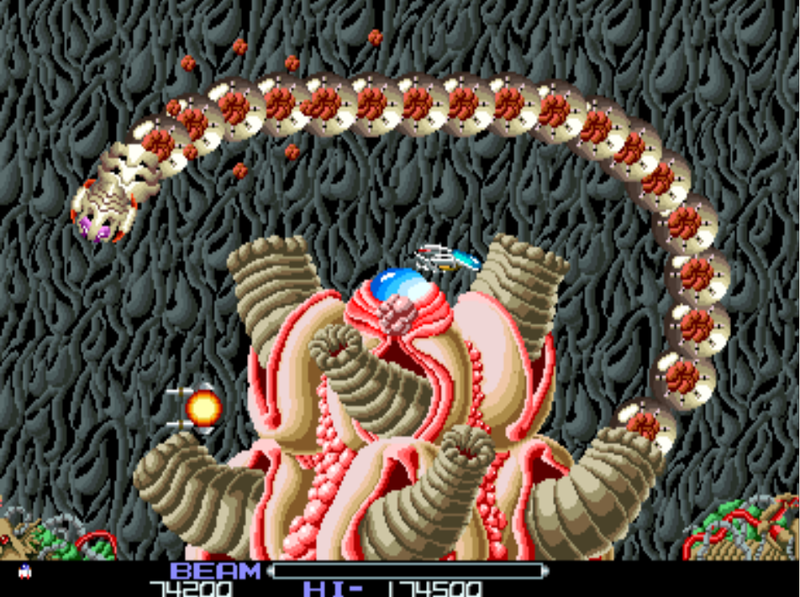 Unlike my other favourite shoot 'em up, 'Slap Fight' where the game continues scrolling; in R-Type, when the player encounters a boss, the game always comes to a stop; although this is with a nod to boss 3, where the entire level is comprised of one big boss. 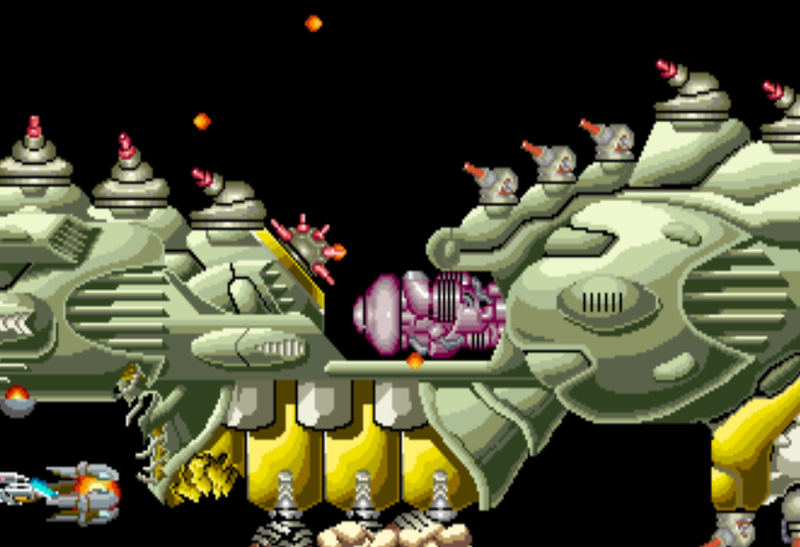 One thing I would say, is that whereas the bosses in Slap Fight made a bit more sense logically, the ones in R-Type are shamelessy overblown creations! They often don't make a lot of logical sense, but you cannot accuse them of being dull and uninteresting! As you approach each boss, the in-game music slowly fades out.....I always loved that. Probably the easiest way to destroy this boss, is to fire your Force into the middle of him. It's best to do this by moving right forward towards him before you release the Force. This will ensure it sits right on top of him, generating damage. Although the Force will start laying down damage upon him automatically (just through it touching him) you will need to fire as well - otherwise he will not be destroyed in time before he starts moving forward. If you shoot one of the 'eyeballs', it will be destroyed and the wires attached to it will retract. If you destroy all four eyeballs, the Boss will be 'unshackled' and start moving slowly towards you. Either way, after he takes a certain amount of damage, he will break free from his shackles and start marching forward. The first boss (shown left) really is an ugly bugger. It looks like some kind of embryo. Wrapped around it are eyes that seem to be attached to long nerve endings which are plugged into some outlet behind the boss. 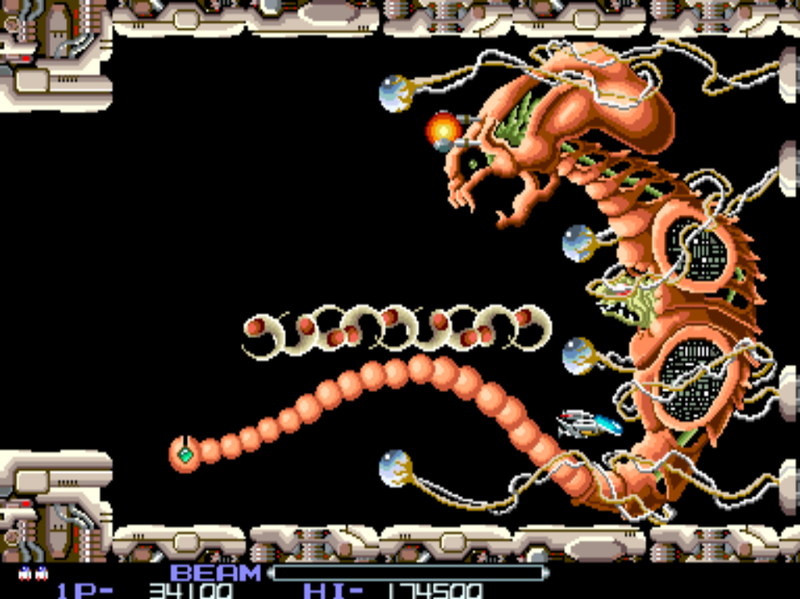 I would say it's a good bet that the design of this boss was heavily influenced by 'Aliens', that was released in cinemas the previous year (1986). Despite it's fearsome look, this boss is very easy to destroy. He has a long tentacle-like tail that cannot reach you if you remain at the rear of the screen. He uses this in an effort to try and keep you towards the back of the screen so he can catch you out with his main weapon. His main weapon is a chain of slow moving yin-yang looking frisbees. These frisbees can only fire in a straight line directly at you, or at a slight angle upwards or downwards, depending on your position. Either way, they are very easy to dodge by simply moving forwards and down/up into the open space. Boss 1 - with a rocket man along for the ride! I initially thought that this boss must be destroyed - or it will destroy you. But I was wrong! You can actually not fire a single shot and survive. There is a small gap that you can fit into (see the image on the left). To get into here, you must wait for his tail to swing out of the way and then immediately dive forwards and down, into the space. It's easiest to do this right at the beginning, although you can do so later as well - but you must wait for his tail and frisbee weapons to synchronise. Once in here, you are completely safe. As mentioned, eventually the eyeballs will disappear, freeing him and he will start to advance forwards. If you have a Bit equipped, be careful not to be positioned too high, because it will start to make contact with the enemy in the centre and it will destroy it. If all is well, just a brief moment before you are about to get squished, your ship will flash (turning invincible) and the boss will pass safely over you. Hey presto, boss completed without firing a shot. 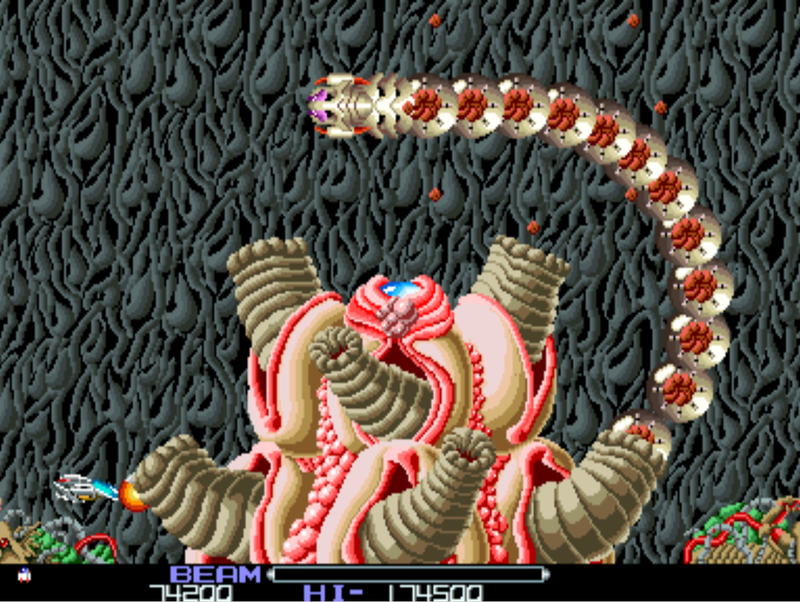 Aside from the techniques already mentioned (or just mercilessly shooting him with your weapon), two full power Beam releases will also destroy this boss. Note that the tail protects the boss from any form of fire you lay down, so make sure it's out of the way. The second boss is a lovely organic boss! It looks like a heart muscle or something similar, with valves and chambers. Just like the first boss, I would say it's very much a creation of its time and was probably also inspired by HR Giger and his various organic imaginings. This is the only boss where a previous onscreen enemy forms an integral part of its design. The final snake that appears on the level, accompanies you to this point and then heads into one of the valves. Each time it emerges again, it will have regenerated its segments. I love the way the valves pulse as the snake moves through them (and the accompanying sound effect is very effective too). There isn't a huge amount of room to manoeuvre at this point, since the 'heart' takes up so much of the screen. However, if you have a Force attached, by far the easiest place to sit is at the bottom left, with your Force just overlapping the valve, so that it will destroy segments as the snake emerges (see image below). Even if you do not have a Force, there are many positions during this boss encounter where you are completely invulnerable. Three such positions are shown below. (Click for full size). If you do just decide to 'park and hide' (I like that!) - then after the snake emerges from the heart for the 8th time, it will self-destruct. However, you can speed up the process by shooting the pulsing 'eye' at the top of the heart. You need to hit this five times to destroy the boss. It's worth noting that if you simply let the boss self-destruct, you will miss out on the 8,000 points for destroying him. I do like the way that when you shoot the 'eye', it snaps shut and stays closed for a time before pulsing again - a lovely design touch! You get 8,000 points for destroying this boss. As mentioned, the snake emerges from the heart up to eight times. This gives you plenty of opportunity to up your points tally.The snake has 18 segments making up its body. Each segment is worth 200 points. So that's 3,600 points per snake. So if you kill the snake eight times, you can rack up a tasty 28,800 points. Because this boss forms an entire level in its own right, please see my entry regarding Level 3 earlier in my review. 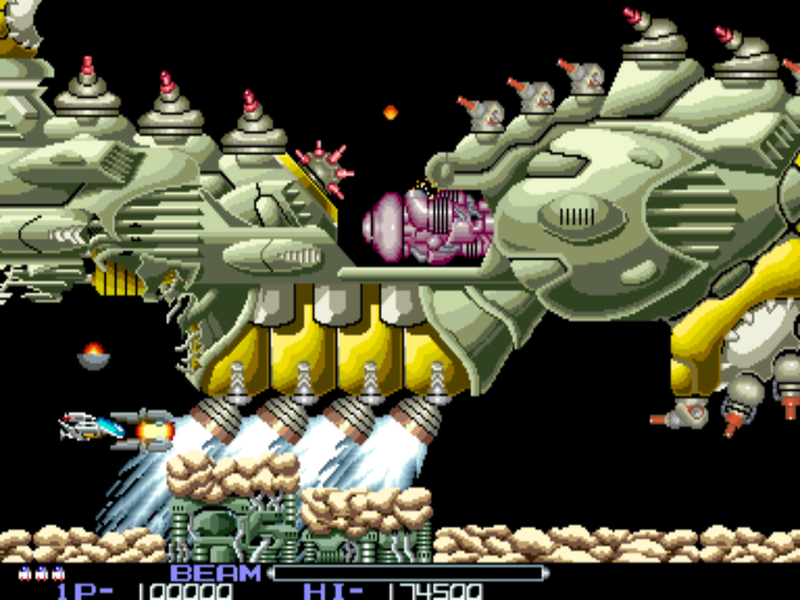 There's no doubt in my mind that this boss influenced later shoot 'em up classics. 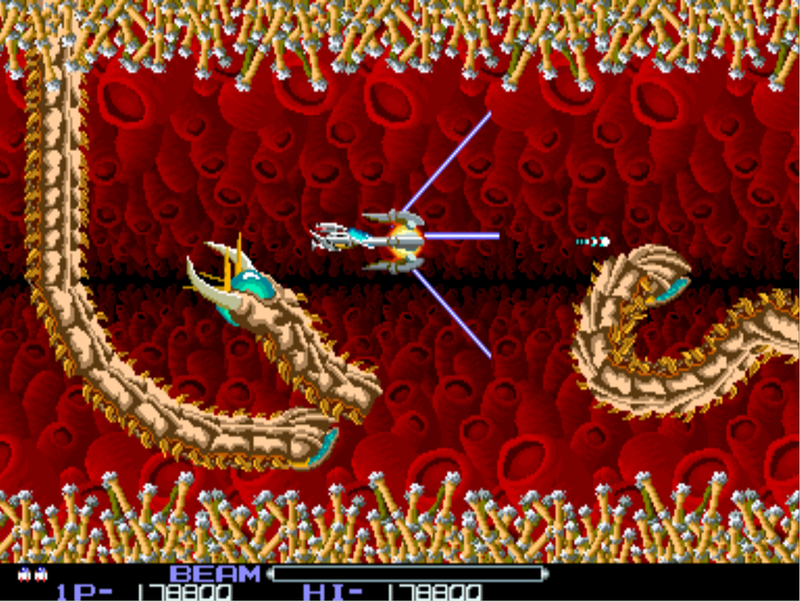 For example, both of Capcom's terrific horizontal scrollers 'UN Squadron' and its sequel 'Carrier Airwing' also contain huge bosses in their final missions which you have to maneuver around in sections. This boss is a ship that is made up of 3 independant, smaller ships that form together. They fly around the screen, constantly splitting apart and reforming. The first few times you meet this chap, you may find it tricky. However, with a bit of knowledge, this boss is in fact the fastest in the entire game to kill. He fires two types of weapons - standard bullets from directional turrets (which only two sections possess) and heavy lasers that will penetrate your Force. However, he only fires these these weapons if he has sight of you. For the bullets, this means they will never fire unless you are to the left of any of the ships. As you approach this boss, it's worth clearing away any stray green blobs that may still be lurking around. This just gives you a bit more room and prevents any accidental collisions! In the image below, you can see a few stray blobs left. As you can see, the bottom detachable ship (which has the green weak spot on the upper surface) can never touch you if you are tight against the right side of the screen and it is attached to another section. However, all of sections can touch you if they are detached, so be wary of this. If you do not manage to destroy the sections fairly quickly, they will start splitting up and moving around the screen. Firstly, one section will detach, and then all three parts will (see image on right). Whilst the sections are detached, they make a decent effort of trying to 'sweep' around the screen, preventing you from hiding in the corners, but it's fairly easy to maneuver back into some empty space. 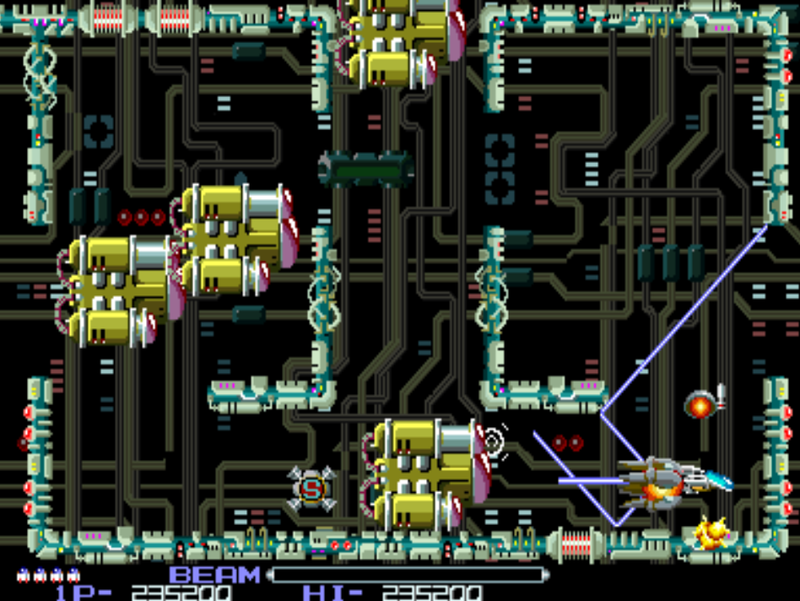 As a point of note, the movement pattern of this boss is affected by your ship's position. So for example, if you sit at the top right of the screen as he arrives, the bottom section will detach and he will fly up to the top, trapping and killing you. When this boss first arrives, he always does so from the left hand side of the screen. The best method for destroying him (and the fastest) is to therefore be ready for his arrival and attach your Force to the rear of your ship. 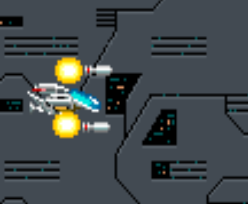 As it arrives onto the screen, you can overlap your Force onto the middle section of the ship and lay down damage. (See the image above). Using this method, you can destroy one section almost immediately. Depending on the exact position of the Force, as you fire, you may actually damage different sections of ship or both the lower and top left sections at the same time. If all is perfect, you can destroy the entire boss in less than 6 seconds! You will need to keep moving with the boss as it comes onto the screen. Even if you do not manage to destroy a section, so long as you are positioned below the top sections of the ship, you are safe, as there is space for you to fit against the edge of the screen. (See image on left). Like all the other bosses so far, you do not need to destroy him. If you decided to just keep dodging the sections and their fire, after attaching and detaching multiple times, he eventually loses interest and flies off the right side of the screen. During this movement off the screen, he can pass through you without incident. Alternatively, you can destroy just one or two of the sections and then dodge the final one (making it easier). I used to call this one the potato boss because it looks like he fires slices of potato at you. 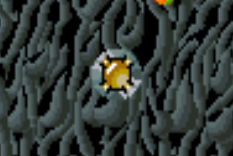 These potato slices fly in your general direction before returning to the boss to afford him protection. Just as the scenery at the top and bottom of the screen does not harm you during Level 5, nor does it harm you during this boss encounter. Therefore you can safely fly to any part of the screen during the boss fight. This is very useful since running out of room (especially so at the beginning of the fight), is one of your primary concerns. For me, this is the first boss that really tests your mettle. Whereas the previous four bosses are all quite easy (especially so when you have a clear understanding of their movement/patterns etc), this boss is always a threat; even on repeat encounters. You can never be too complacent with him. Pleasingly, there is no 'safe spot' for this boss. So you cannot 'park and hide' like you can with boss 2. Hence you will find yourself having to manoeuver around the entire screen. 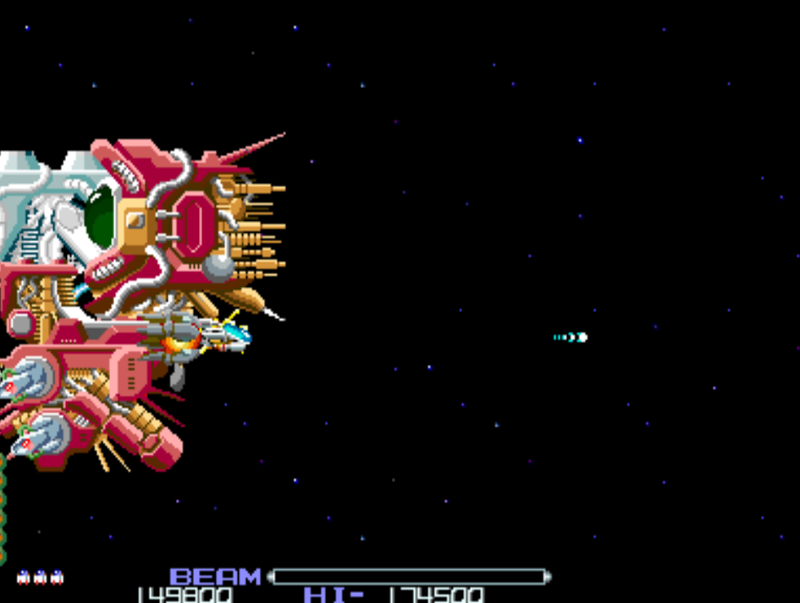 If you have a Force equipped with a full power weapon, one decent method is to lay down a couple of full beam releases as soon as the boss appears and then immediately attach it to the rear of your ship. With the Force attached to the rear of your R9, you can then hammer him with your special weapon (Ribbon is best) when you are ahead of him and use your Beam when facing him directly. As his spuds slowly diminish, you will see the actual Boss ship revealed underneath. As soon as you are able, you can concentrate fire on him directly, as you do not need to destroy all of the potato peelings. Note that your Force does not cause 'touch damage' to any of the potato peelings - nor to the ship itself. So you have to actually lay down fire to cause damage. You can safely fly into the spikes of the Boss ship and not be harmed. Only the central portion will destroy you if touched. When the boss ship has been destroyed, you should still avoid any potatoes that are on the screen; as they remain lethal. When the boss first appears, sometimes he will be quite close to you, other times he will be near the far end of the screen. This seems to be random and can make a big difference to how good a start you can make. Treat the flying spuds with respect, since their movement is not entirely predictable. As they fly outwards from the ship, they will be aimed in your general direction and then return to the cluster. Because their aim is pretty good, you may find that you run out of room on one side of the screen - and so will have to dive around to the other in order to avoid being killed. 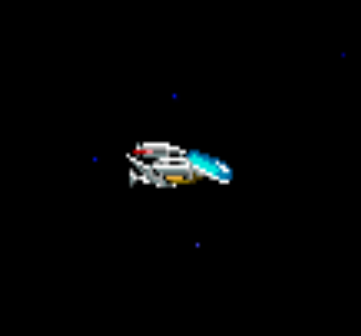 The ship itself is also drawn to your position, so if possible, you should use this and attempt to 'draw him into a section of the screen and then quickly move away into the open space. The Beam weapon is very good to use here, since it clears the spuds fairly rapidly and you can also use it to pick off any individual ones that attempt to fly into you. As with the previous bosses, this boss does not need to be destroyed. So if you take too long to kill him, he will eventually depart the screen. Likewise, if you end up clearing all of the potatoes, the boss ship itself does not fire any weapons. So you can just lazily keep out of his way await he leaves. When he does fly off, he does so by zipping rapidly off the right side of the screen. During this flying movement, you can let him pass through you without incident. 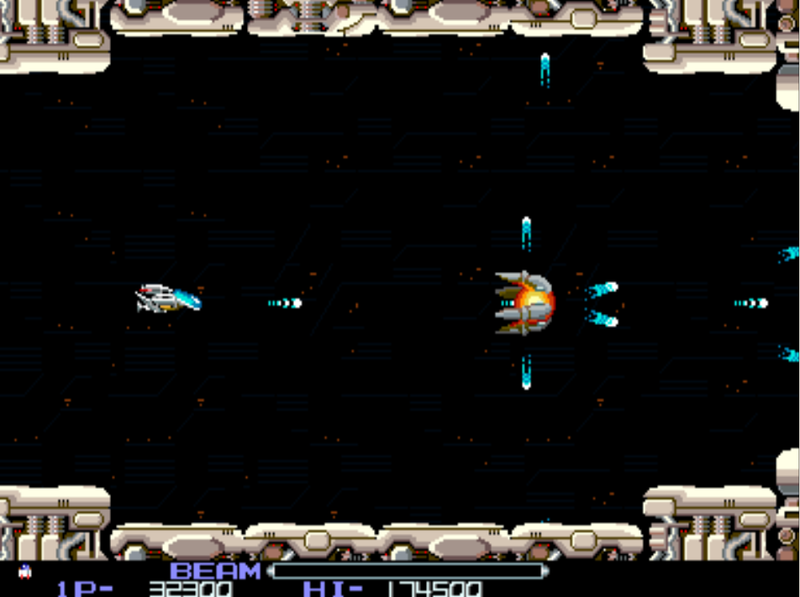 This one is not so much a single boss, but an encounter where many ships fly around the screen. These ships are the same ones that dominate the previous rest of the level. If this is your first visit to this boss, you may well die here! Just like the level that preceded it, you may need some experience on how the ships move and where to position yourself. Generally speaking it is important to take out the majority of these ships as they rotate around the screen; since if you don't, at certain points, you will run out of room and be squished. The best way to do this is by being on the right side of the screen. I tend to sit at the bottom right (see image on right). Beware that some of the ships have their vulnerable pink parts (ooer) on the opposite side. For these, you should charge a Beam up and take them out. Only a partial beam is required. They're quite easy to kill. As mentioned, if you arrive at this point for the first time, it is most likely that you will die, since it takes a couple of play-throughs to understand the ship movements and learn where to be. Back in the day in the 'Quay Amusements' in Poole, I used to love watching Gary Harrod play this level. He was amazing! If you have a Force attached during this Boss, remember to keep an eye on your ship position and not your Force position. It's quite easy, especially when dodging one of the 'reversed' ships, to mis-judge the gap and crash into one of the walls. Remember your Force is indestructible and so can overlap a wall. And you will need to do this, to fit into some of the tighter spaces. Also, if you are equipped with the Ribbon weapon, because of this weapon's 'shape', it's possible to get caught out because the actual ribbon may not be making contact with the boss ships' target area. For this reason, it is best to move further away from the approaching ships if possible, this will make sure the smaller rings are contacting the target area and laying down damage. So be careful. Occasionally you may find that you cannot take them all out in time, and you will have to be quick and perform a dodging maneuver and circle around of one of the ships, so stay on your toes! Using this method gives a good success rate - though you won't actually destroy the boss this way - he will just give up and respectively depart. Generally speaking, try and position your ship in between two of the chutes. This gives you best chance of dodging the junk. Some of the very smallest pieces of junk will not cause you any damage and can pass right through your ship. However, it's hard to clearly identify these, so it's best to avoid everything! 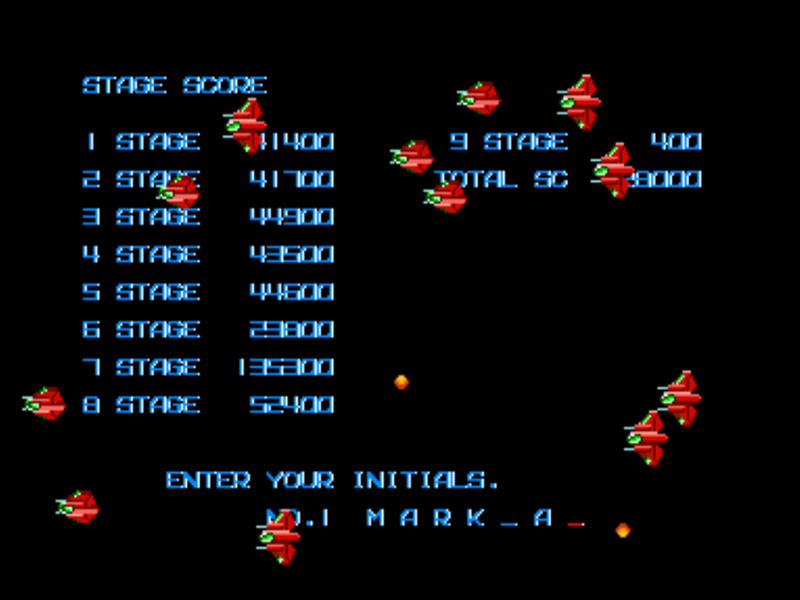 I never got this far when I played the game in the arcades, but have done so frequently now whilst playing on an emulator. Having now had the opportunity to play this level a great deal, I have discovered a spot where you can sit, where you are completely invulnerable! Amazingly, if you position yourself between the two top left vents, (shown below) you are completely safe. What's more, you do not even have to fire a shot (although it is necessary to have a Force attached). The seventh boss! - And what I call the 'junkyard' boss. Five 'disposal chutes' (which are initially closed) open up and begin dropping lots of pieces of junk and debris down upon you. The main thing to do with this boss, is not panic. If you start going crazy, flying all around the screen, you will likely fly into some junk and die. Stay fairly still and just move to avoid the junk if necessary. Periodically, some long stalk like enemies pop up from the bottom and take pot shots at you; these can cause you problems as you need to avoid these bullets whilst also keeping away from the falling junk too. The actual 'boss' appears occasionally at the right side of the screen. He has like a hoover attachment on him, which he waves around, but he does not fire; so he causes you no problems if you are outside his very short range. One method I found that works quite well, is to detach your Force and stay fairly low on the screen, below your Force, and then move backwards and forwards, so the Force never has a chance to move fully in front, or behind you. This way, it hovers directly above you and protects you. Stay nice and calm with this boss.. I have to say, I find things like this to be a little disappointing. Here we are, at the penultimate boss, and you can you just park up on the screen and not be hit - and get through the boss! I appreciate that in an arcade setting, it would be fairly unlikely to discover this, but still, surely this represents poor play testing at Irem? Occasionally (not on every play through) Mr Power-Ups will drop out of the junkyard chutes and deposit Laser power-up icons. Interestingly, you do not have to shoot them; they are destroyed when they hit the bottom of the screen where they then drop their goodies. If you do die during this boss encounter, you will find it extremely difficult to survive your way back here from the checkpoint. I haven't managed it yet! I must admit, just like the actual level that preceded it, I'm a little disappointed with this final boss. Perhaps it's just the black background, perhaps it's the uninspired enemies; but it all looks a bit flat and rather dull. After all, this is final boss and you would expect something a little more exciting. However! Aside from its dullness, if you want to complete the game, this boss must be vanquished and here are my tips to help you do this. Firstly, if you position yourself tight against the rear of the screen, vertically positioned in the centre, you cannot be harmed so long as you have a Force. attached. This holds true, even if you do not fire your weapon. However, as you will see, this immunity does not last forever. It's clear that this boss is a little more canny than his predecessors as initially you cannot harm him. Protecting him is a barrier-like wall of tentacles. Note that I said tentacles and not testicles. This barrier of testicles (note I said testicles) prevents any firepower from striking him. 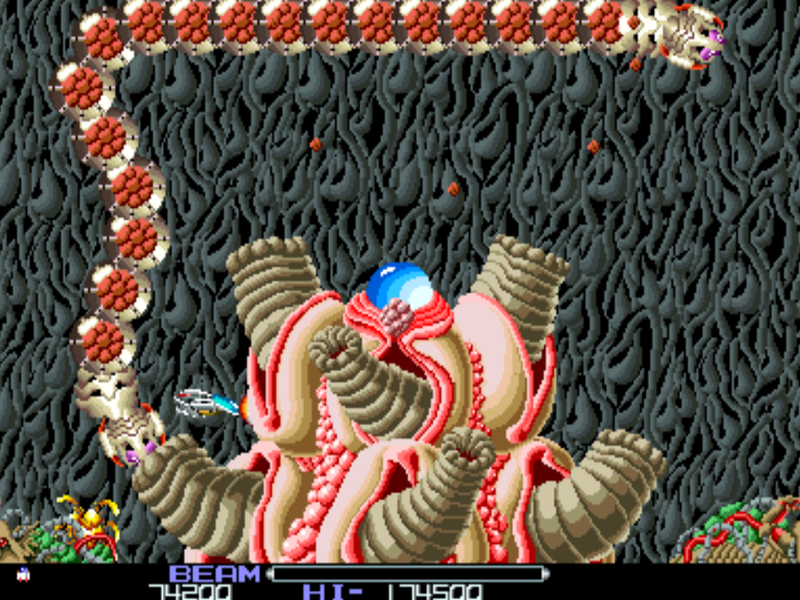 However, at regular intervals the tentacles open up and he fires out a 'whirlwind' type enemy which then flies around the screen. (One such whirlwind stays with you from very near the beginning of the level and accompanies you all the way to the boss). Although they do not fire, if you touch any of the whirlwinds, you will die. The same is true of the flying babies. (Again, you are safe if you stay at the back of the screen as previously mentioned). You cannot defeat this boss with your Force attached. You cannot defeat this boss using just the Beam weapon. When the boss releases his third and final whirlwind (meaning there are now four on the screen), the tentacles never re-open. In order to destroy this boss, you will need to fire off your Force into him. However, you must wait for his tentacle barrier to open before doing so! 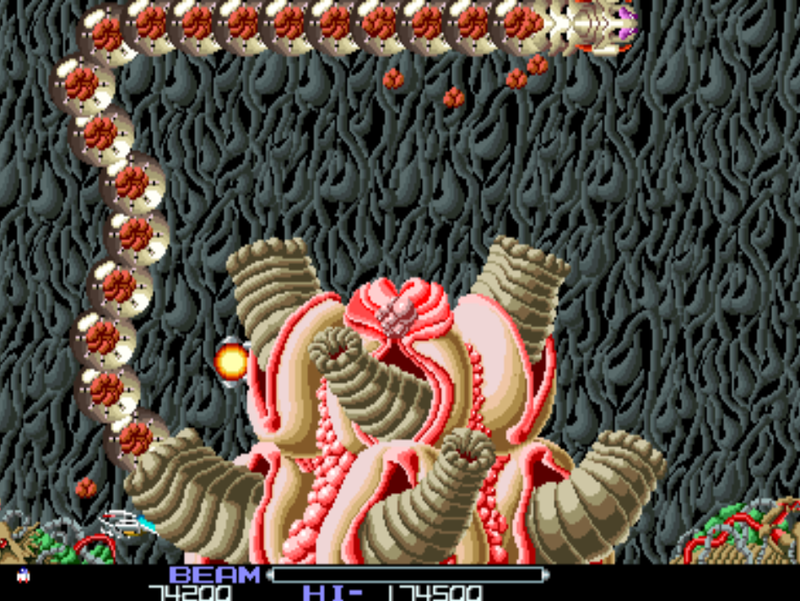 If you fire your Force at him when it's closed, it will become 'stuck' on the tentacles. (See image above.) If this happens you will be unable to recall your Force until the barrier re-opens again. Furthermore, after a short time with four whirlwinds present, there is a pattern change in the whirlwind movement and it is no longer possible to sit safely at the back of the screen. This pattern change is clear and obvious and when it happens, the whirlwinds group together and relentlessly hunt you down. It is only possible to survive at this point if you have full speed-ups. And even then it is very, very difficult since in having to avoid the chasing whirlwinds, you will likely crash into a flying jawa! Your best bet is to avoid this situation altogether. And to do that, you must fire your Force into him when his tentacle barrier opens up. I have to say that it's a clever bit of design; because for the first time, the game forcibly robs you of your Force. It's the only way to destroy him. *Once the final whirlwind is released, the barrier remains closed and you can no longer damage the boss. However, if you have enough speed, enough skill and enough luck, it is possible to stay alive long enough for this final boss to self-combust. If you can pull this off without cheating, do let me know! You will fly through his remains and join your comrades! If you do manage to get this far and destroy this final, evil entity, then congratulations! There is no doubt you are a fine, fine player. 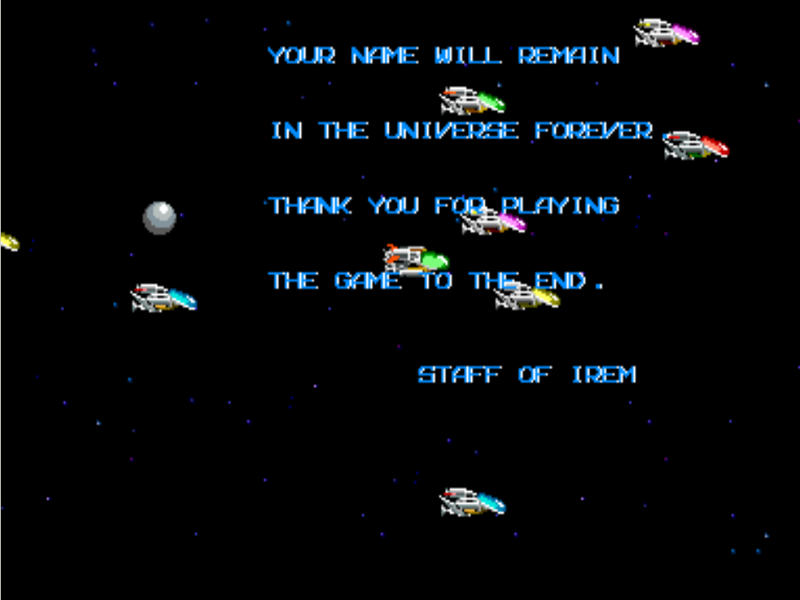 You have played through R-Type and have completed the game! So now you have a 'free game'. I quite like the fact that Irem actually thank you for playing through the entire game and that they then they offer you a free one. I like this because it's as if they are admitting to you that you have completed the game and now here's a freebee. It's a classy end to a classy game. The Bydo empire will never scare people again! When do you 'go round again', the game adds one to each standard level number. So the first level after the final boss, is called level 9; level 2 is called level 10 and so on. When this 'free game' starts, you keep all power-ups you already had when you destroyed the final boss. However, don't feel too chilled and pleased with yourself because second time through, the game is a LOT tougher. I don't think enemies move any more quickly and I don't think there are any additional enemies; but they fire a lot more aggressively and many possess a LOT more hitpoints. Also, bosses are much tougher and new firing patterns emerge. Put together, these changes make it extremely difficult to survive. You will very likely lose all of your remaining lives on the very first level! (Called level 9 at this point). Each of the levels in this free game are exactly the same in layout as they were previously. All scenery and structures are identical. However, as mentioned, the 'hit-points' of certain enemies are now pretty huge. For example, the plants on level 2 are incredibly tough and take an age to destroy! The large 'main engine' on boss 3 is also super-strong. Many enemies now fire a lot more rapidly. For example, the snakes on level 2 now shoot at a far quicker speed. There are endless other areas which are harder, but all been told, if you survive the first free level, I doff my cap to you! If you do somehow manage to complete all eight levels for a second time (which I think must surely only have been legitimately achieved by a very, very few people) the same game-ending is played out, but this time the game does actually end for good. Besides which, I say thank goodness for that! You will need a rest anyway. You've had your free game, now let someone else have a go! Enter your name, brave pilot! When your game ends, a list of the levels that you reached is displayed, together with the score that you achieved on each one. This is a very unusual feature, but unfortunately it is the only time you will see this information. After you have entered your name, only your total score is ever displayed. When you think about this, it's a little bit disappointing (maybe even pointless?) - since you have almost no time to register this additional information or to remember it. - We didn't even have digital cameras in those days, so you couldn't even take a quick picture of the screen! As you enter your name, a nice little tune is played out whilst some low level enemies fly past in formation as you do so. I quite like the fact they are flying from right to left (just as they would be in the game). It's as if they are heading onwards, unhindered! In a nice little upgrade from the old three initials, R-Type allows you to enter up to seven characters, including punctuation. Very nice! After you have entered your name, you then (unlike Slap Fight) have the opportunity to continue. A 10 second timer counts down onscreen, in time with ten musical notes. Each note played being higher than the previous one to provide a sense of heightened tension. It's as if they saying, 'Are you sure? You will lose all your progress!' The large onscreen numbers that count down are made up of the letter 'O'. The 'continue' option is available during the free game too. 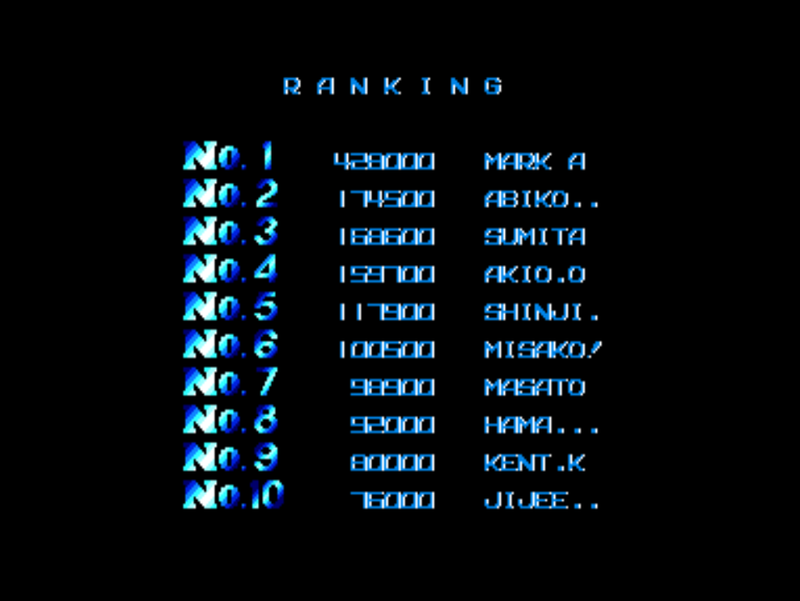 Incidentally, when entering your name on the hi-score table, if you leave a character 'chosen', but do not actually commit it by hitting fire; when the timer runs out, the game assumes you did not choose that character and it leaves a blank space. This is very unusual in arcade games! 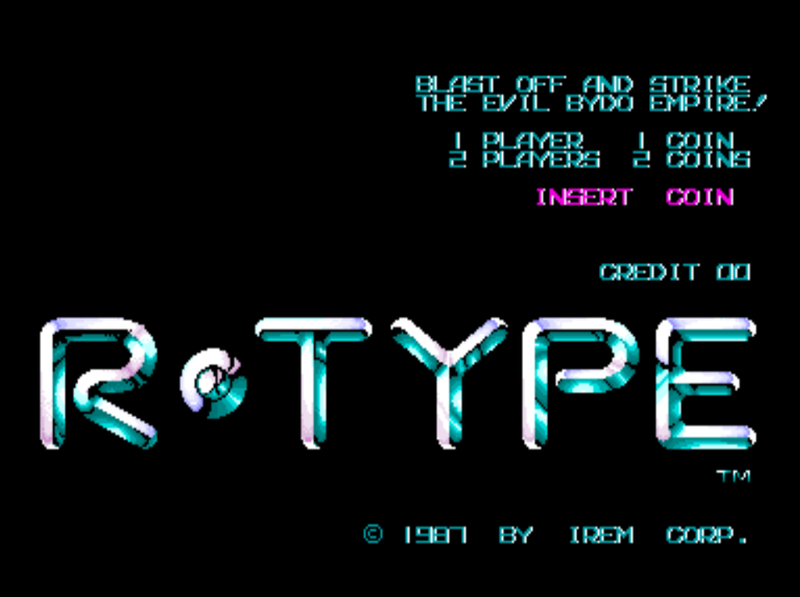 Not so unusually, R-Type allows for a maximum of ten names to be populated on the table. (Example on right). 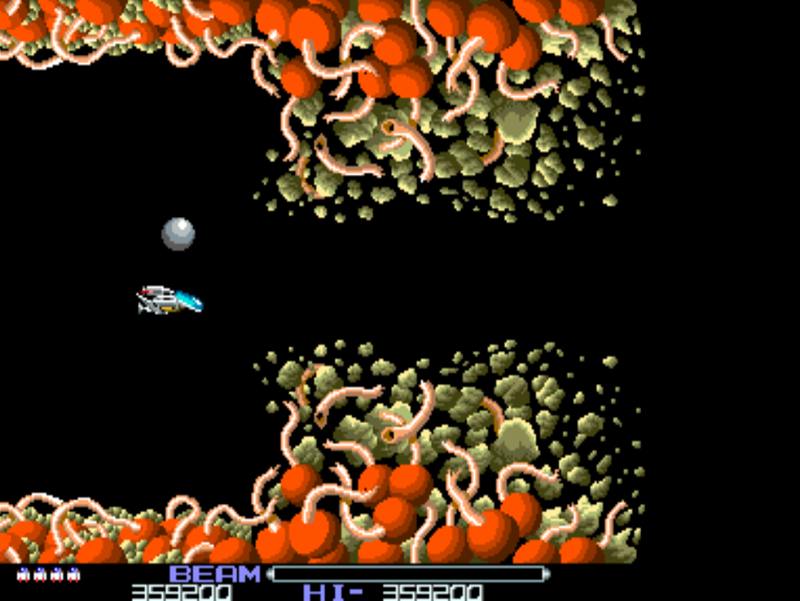 R-Type is remarkably bug-free. Please do let me know if you find any real bugs. I have only found a couple! In the attract screen, (and if you have a credit waiting to go) the evil empire is mentioned as being 'Bydo'. 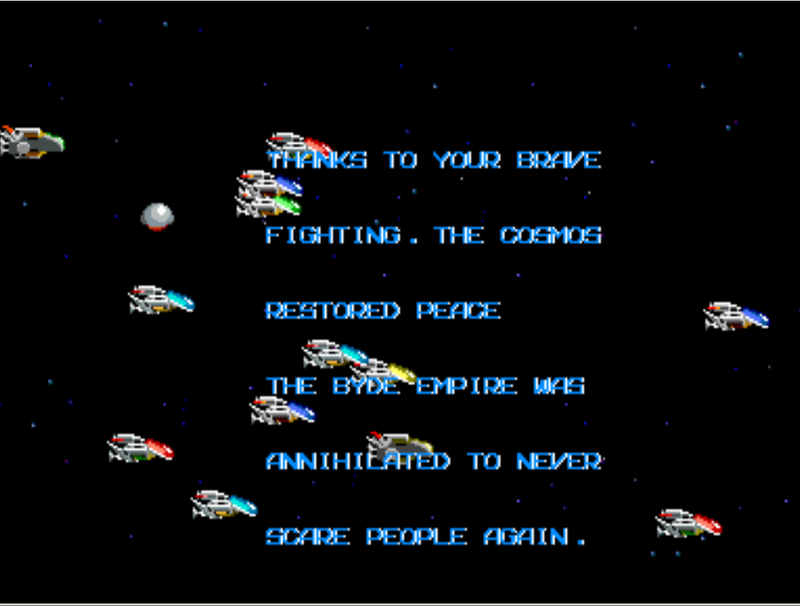 However, when you complete the game, the end credits call it the 'Byde' Empire. I suspect that the end credits are incorrect and its probably a typo! During the Boss 6 encounter, there is a spot where your Force can get stuck against the barriers and is not possible to recall to your ship. (The bottom left 'L' shape). If you destroy the 8th boss and die just at the same time, a bug occurs whereby you can move briefly, but then the game starts to play the automated end sequence. Unfortunately, you cannot then move your ship and you will hit jawas and lose a life. Also the screen is not drawn correctly. The speed-up burst animation is shown every time you pick up a speed-up - even if you are already at full speed. (Although to be fair, I don't class this as a bug, I mention it merely out of curiosity). 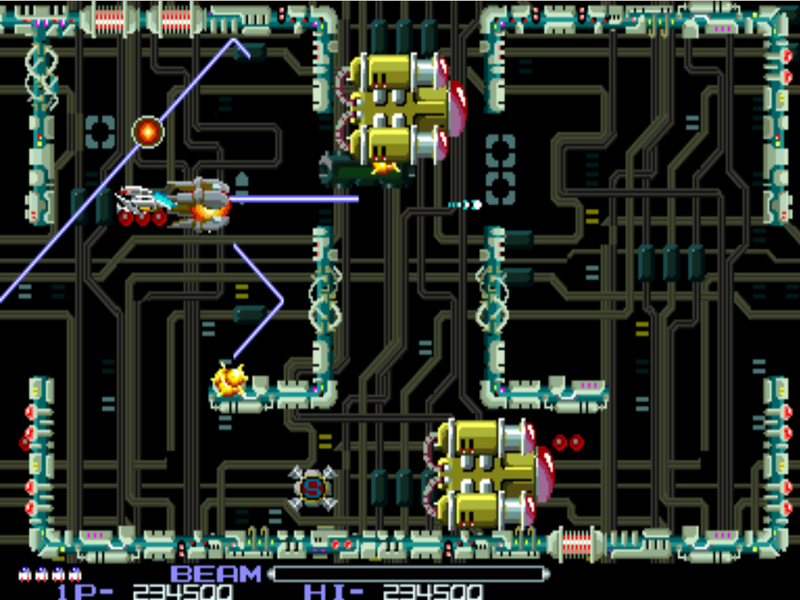 When a level is completed, the player's ship is drawn automatically to the middle of the screen, the background darkens and a stage score is displayed. During this automated ship movement, if the ship passes through any power up, it will collect it. The Mr Power-up enemy always looks exactly the same, no matter what power-up he drops. Hence there is no way to tell what he will drop, aside from through experience. If you need to swap the Force position from the front or rear of your ship, try and do so when you have some space to manoeuver! 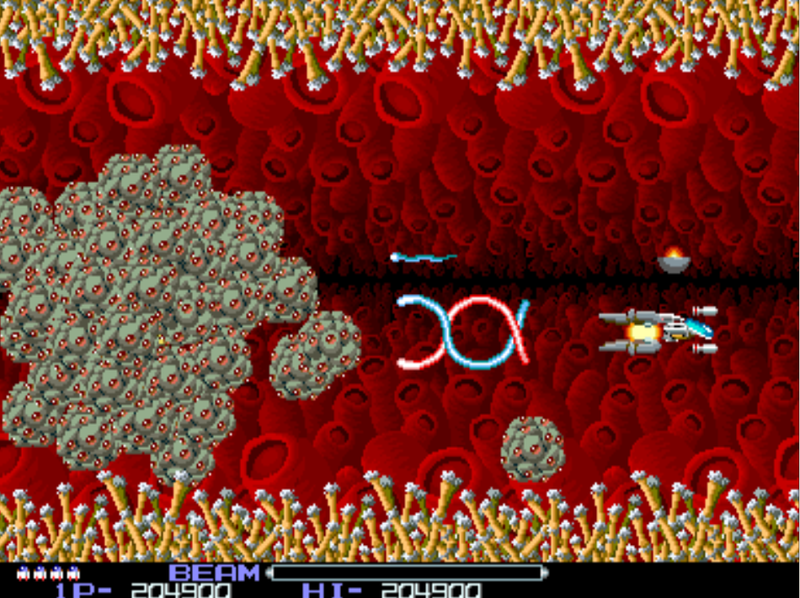 When you lose a life in R-Type, you restart the game from a transparent 'checkpoint' . There are three checkpoints in each level. Should you be on the 'free game' and die, if you continue from that point and die again, the game denotes the levels you are playing as levels 9 - 18 (it discounts levels 1-8). If it's game over and you enter your name, and then afterwards continue, the game starts you off from the previous level checkpoint - as if you just lost a life when you last played. You do not necessarily start at the beginning of a level. Interestingly, a level 1 Force that is attached to the rear of your ship, does not fire any weapon. This is the only specific instance of a Force not contributing any form of firepower. When you move your ship vertically on the screen, it partially rotates, so that you can see underneath the ship and more of its roof. 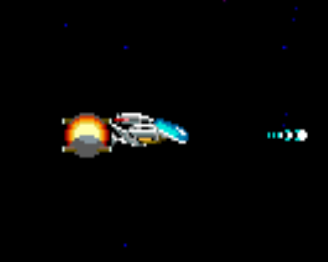 When you die and you restart with a new ship, there is a brief period of invulnerability, which is indicated by the ship flashing very rapidly. The Mr Power-up enemy never fires. But you will die if you crash into him. I hope you enjoyed my write up on this game. 'R-Type' by Irem, truly was a groundbreaking arcade game and a real innovator, and my thanks go out to all of the original team at Irem for creating such an awesome piece of entertainment. If you have spotted any errors or have any additional information that you think I have missed, do please contact me, I would love to hear from you!